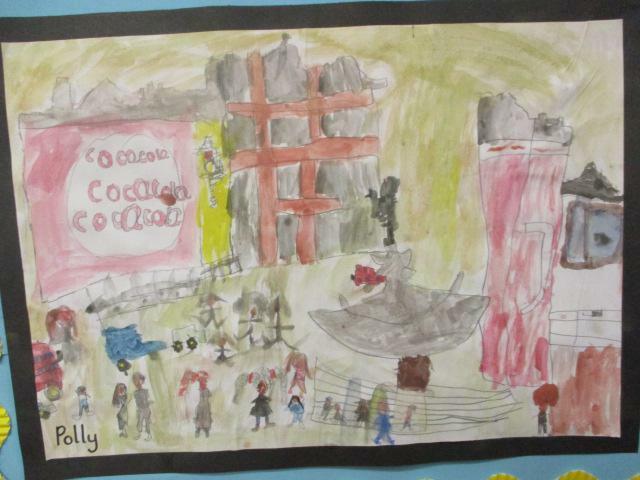 This half term our topic in year 1 is ‘The 1950s’. 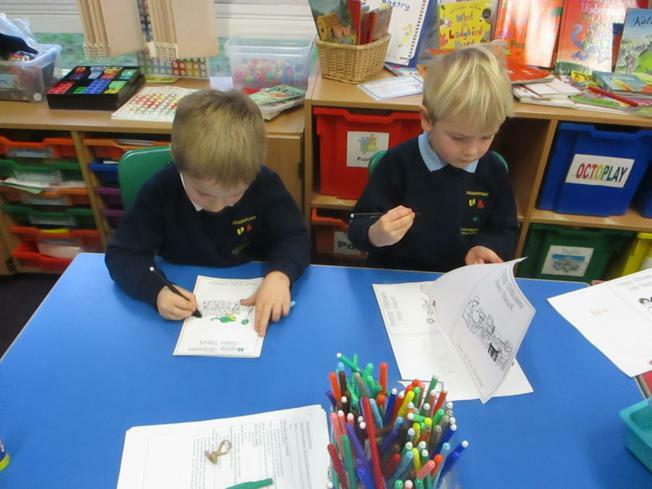 The children began their topic by finding out about Queen Elizabeth II and the Royal Family. 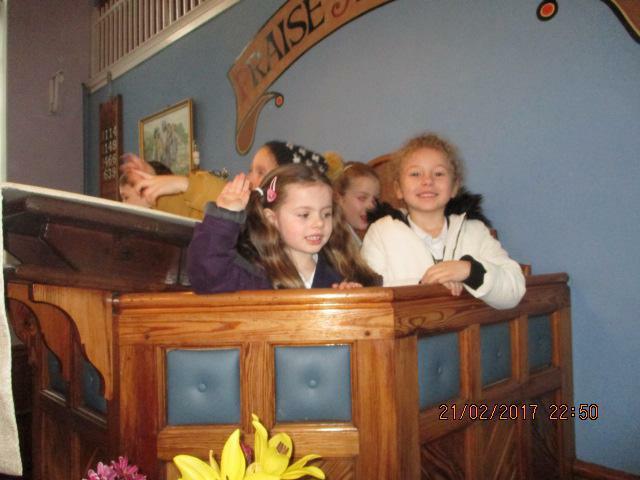 They enjoyed watching footage of her Coronation as well as exploring her family tree to the present day. 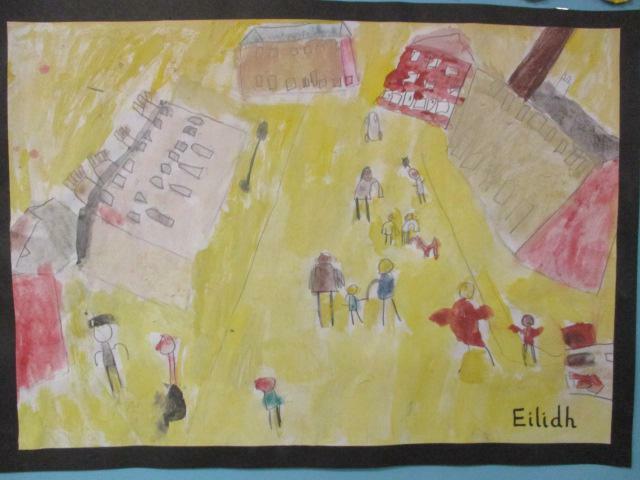 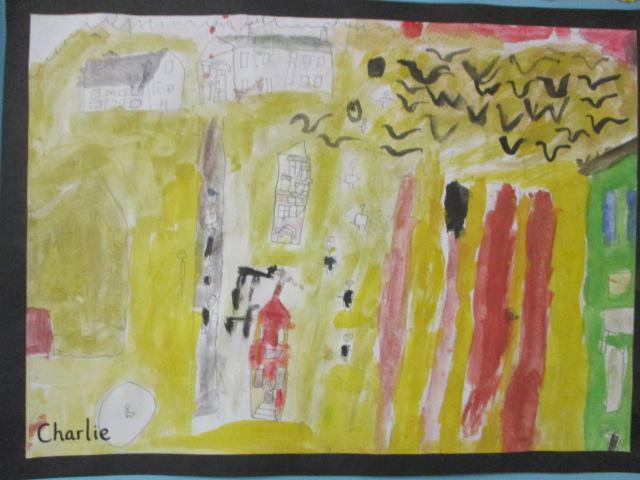 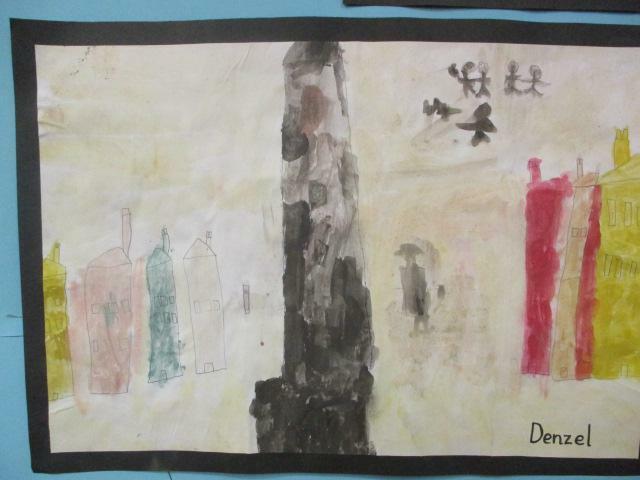 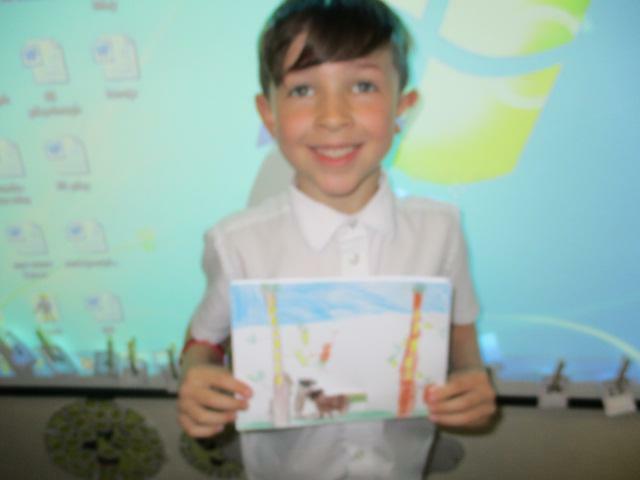 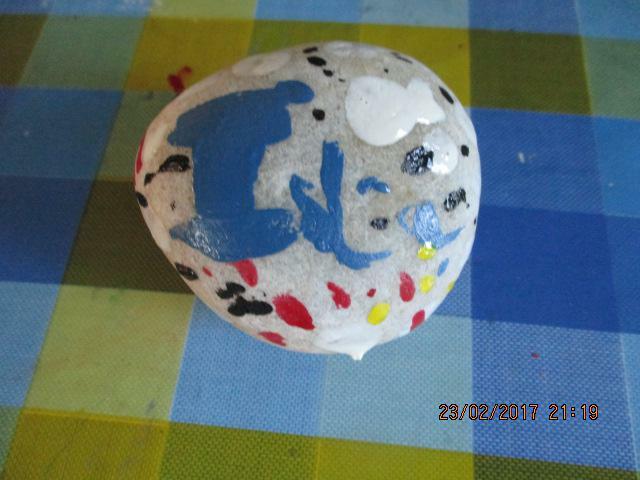 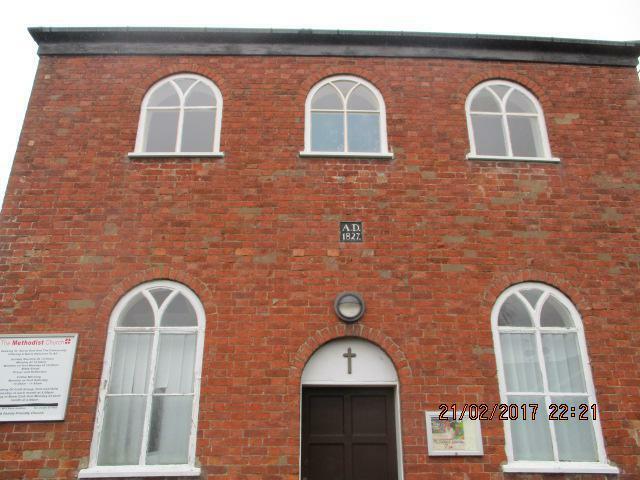 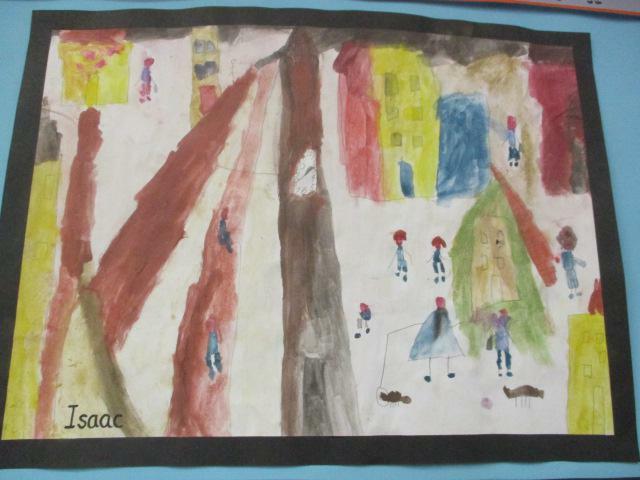 We have also learnt about the life of a famous artist, L.S. 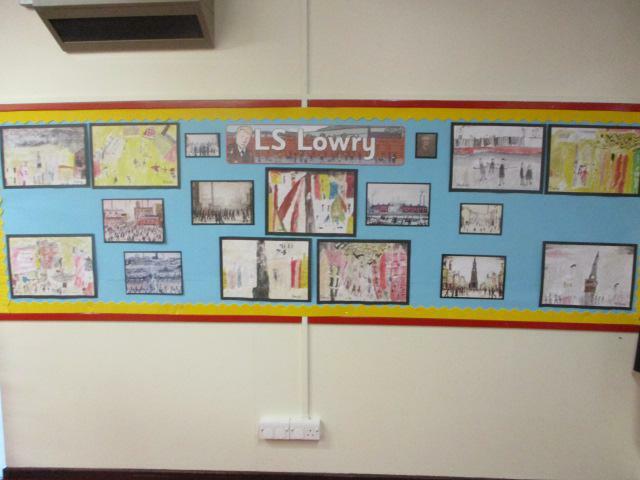 Lowry, who was chosen to be the official artist for the Queen’s Coronation in the 1950s. 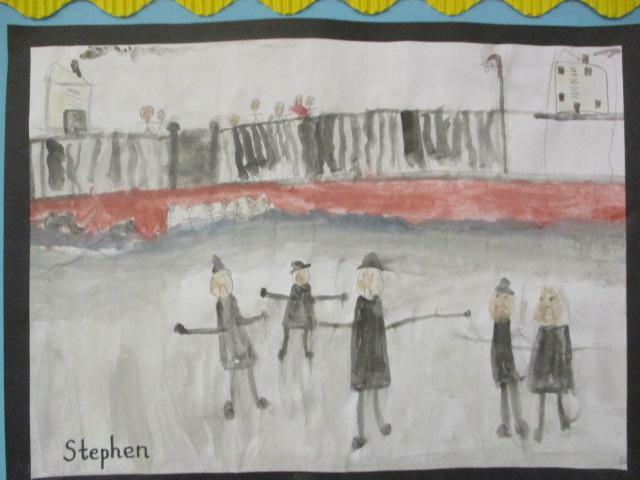 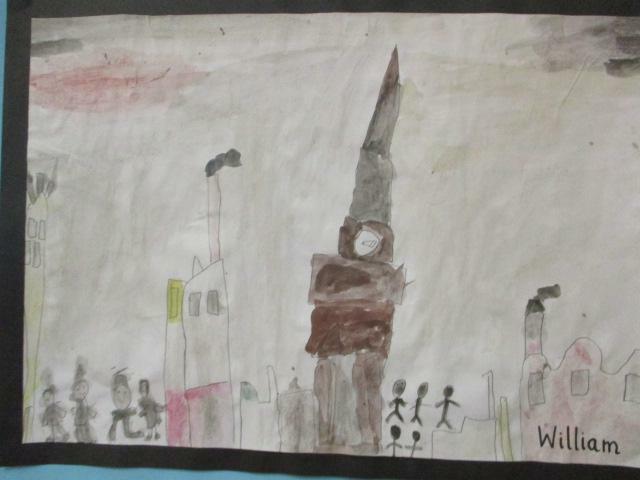 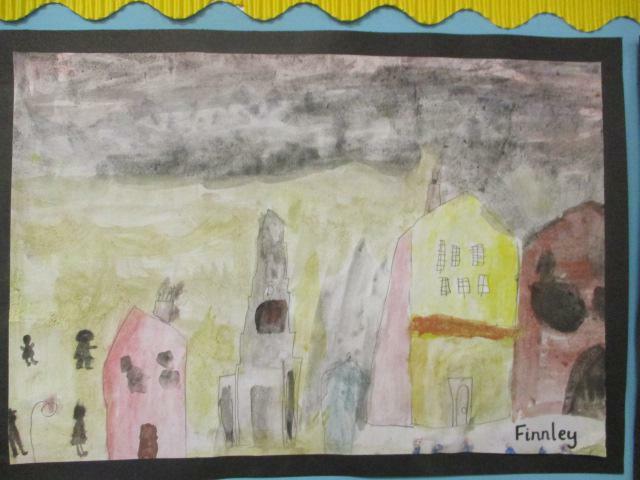 The children looked at a selection of Lowry’s work and recreated their favourite chosen piece of artwork using water colours. 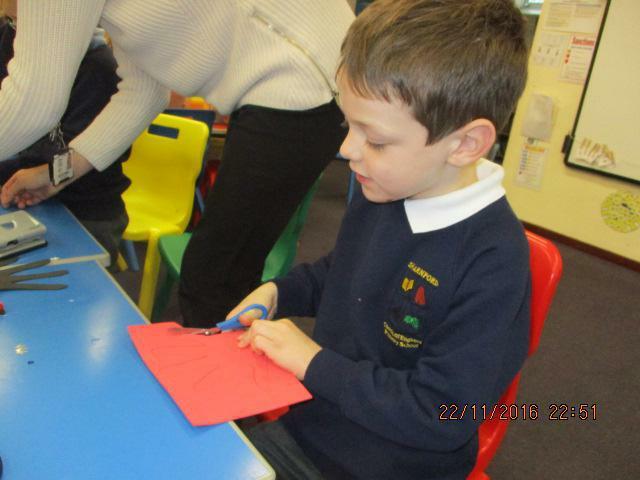 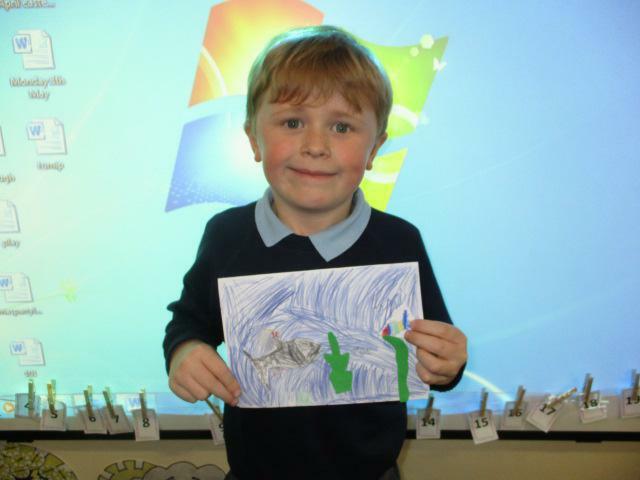 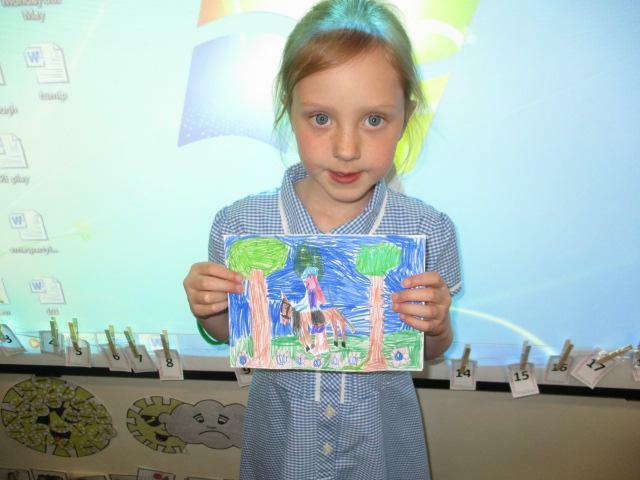 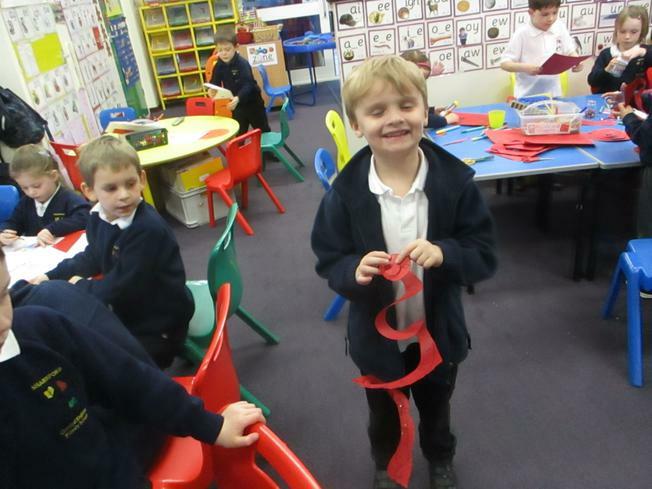 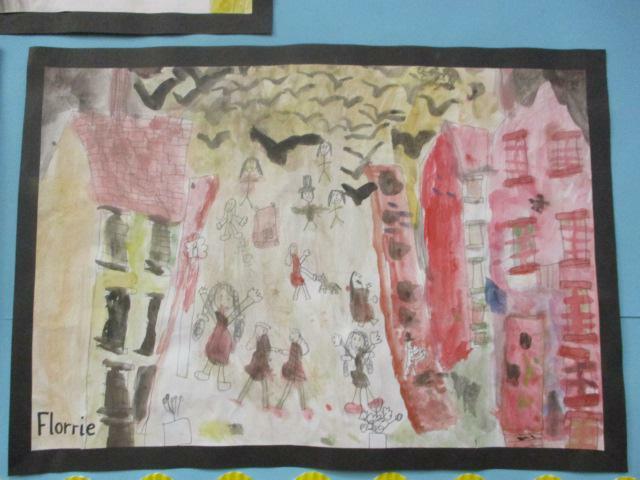 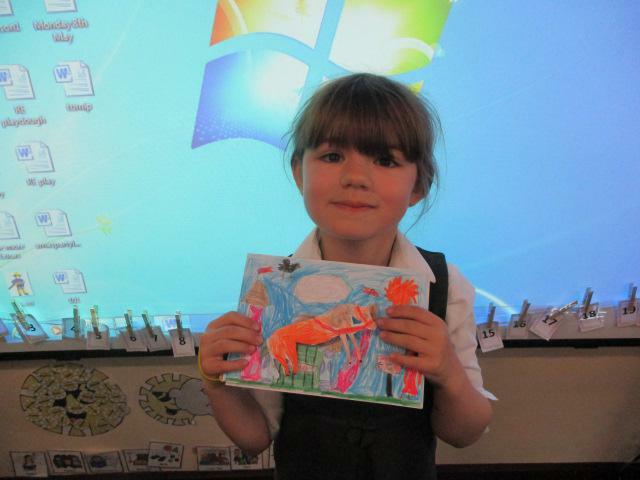 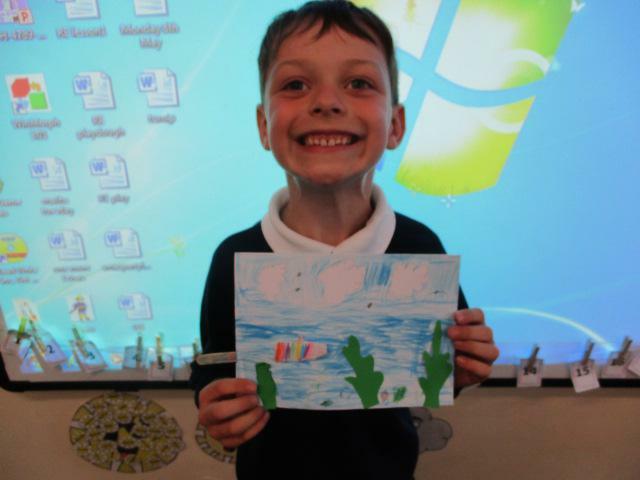 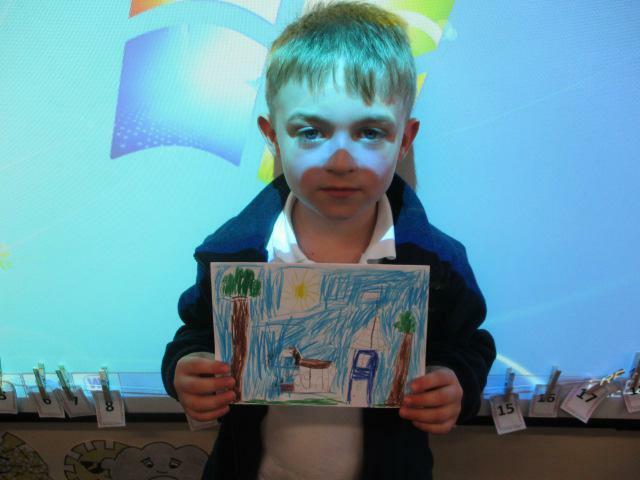 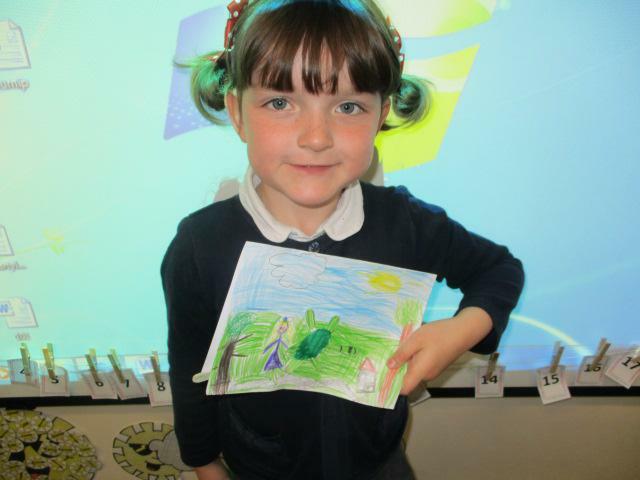 Year 1 DT - we created our own sliding pictures. 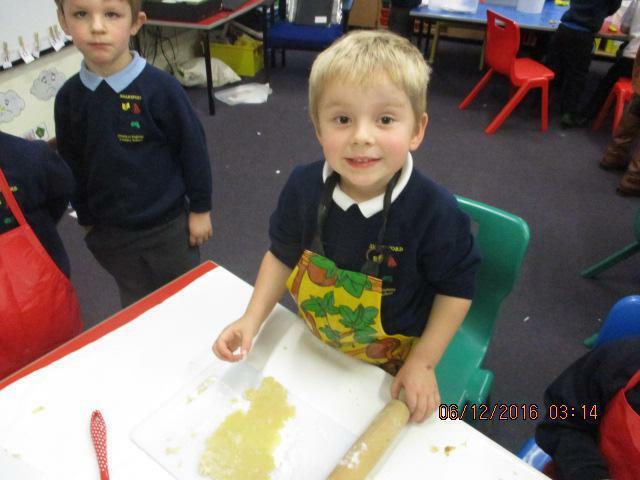 What an exciting term we have had! 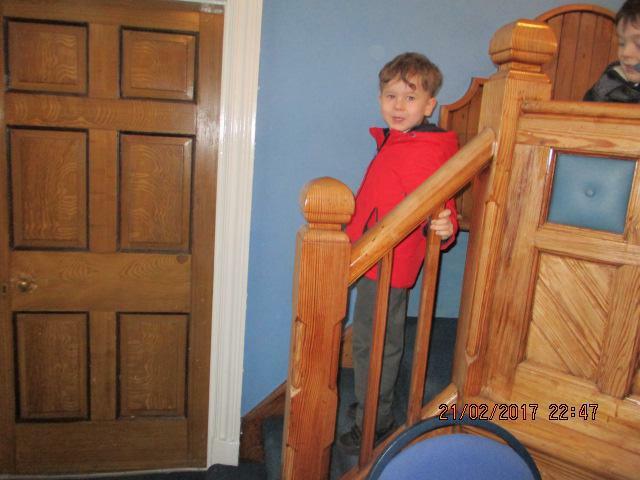 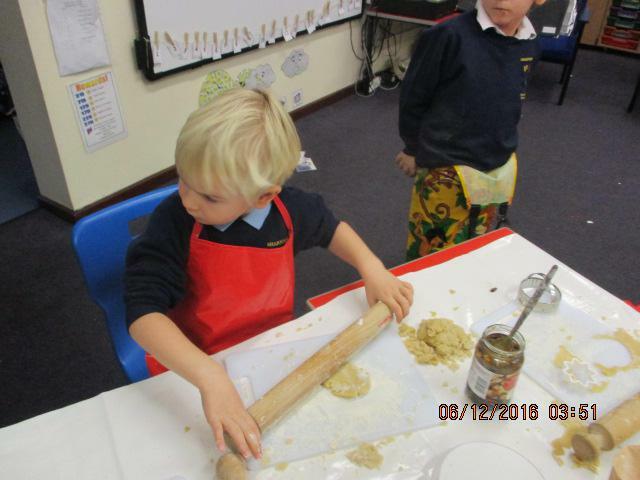 Year 1 children have thoroughly enjoyed Paddington’s Adventures around the world. 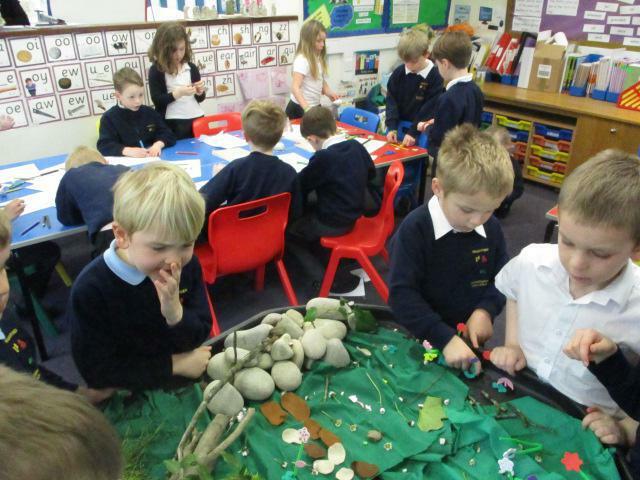 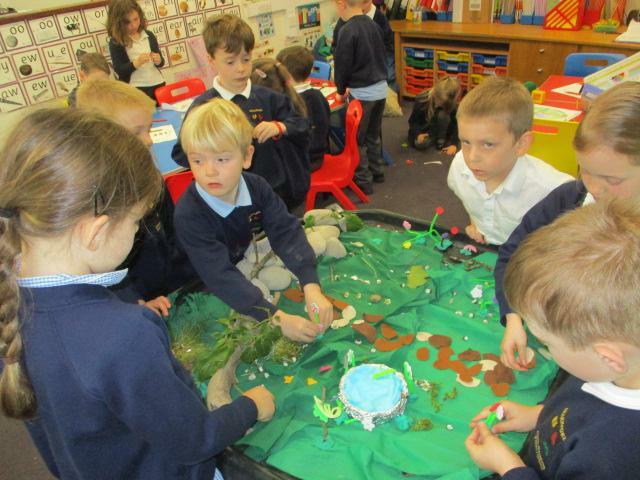 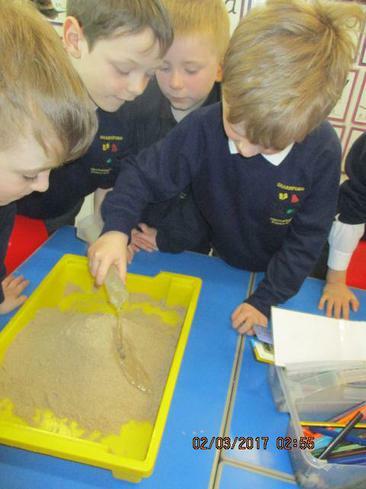 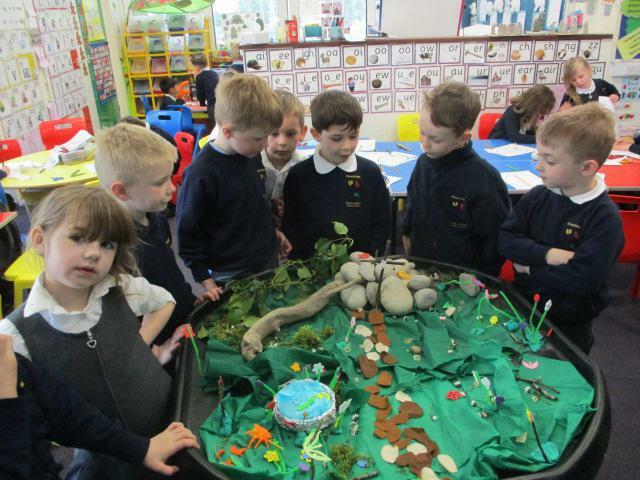 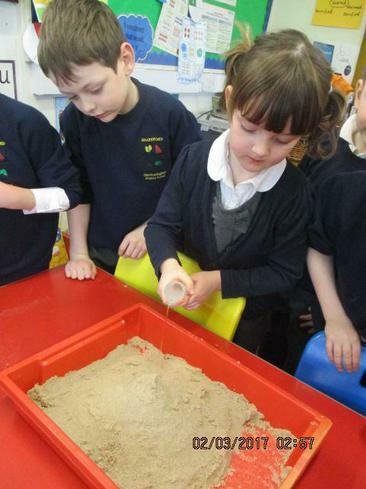 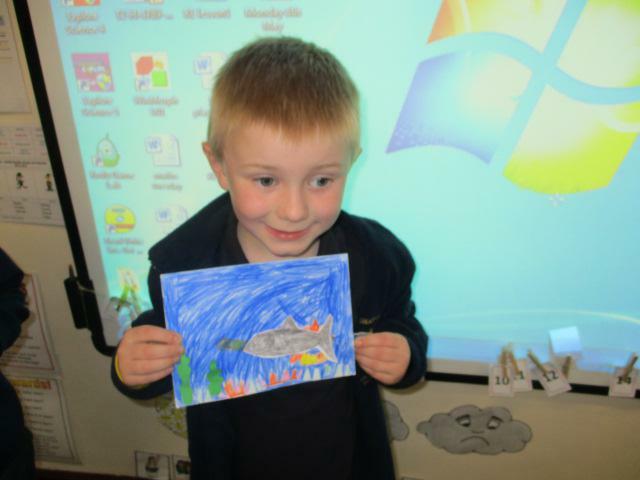 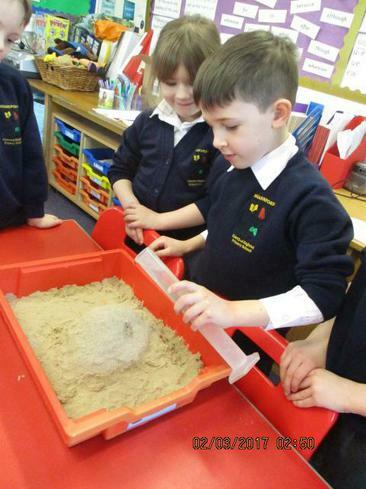 They have enjoyed learning about rivers, mountains, continents and oceans. 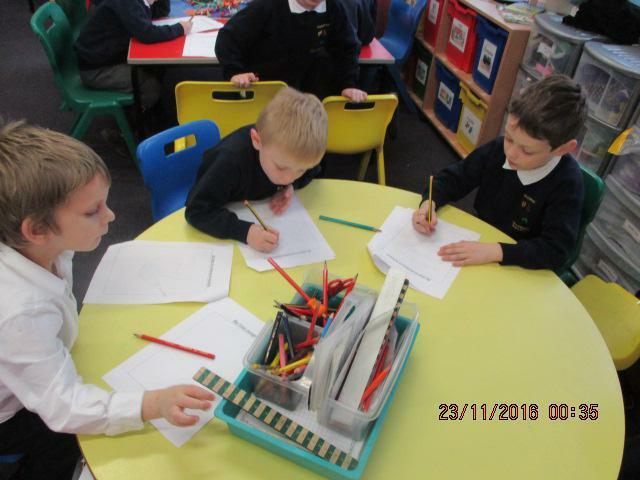 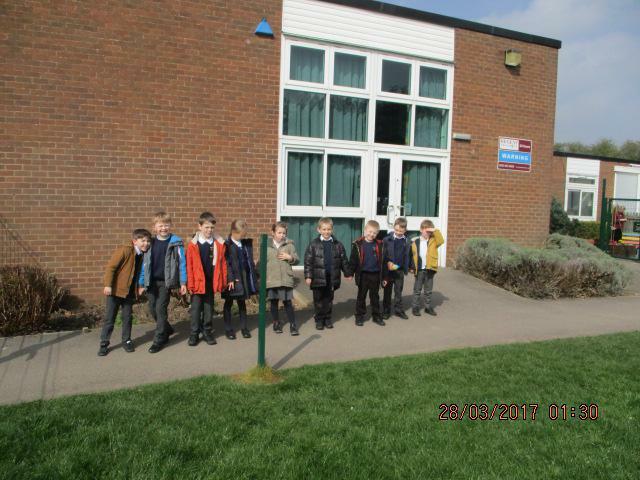 They have learned about different countries including Africa, the Arctic, the Antarctic and finally the children walked around Sharnford Village to make a map for Paddington Bear. 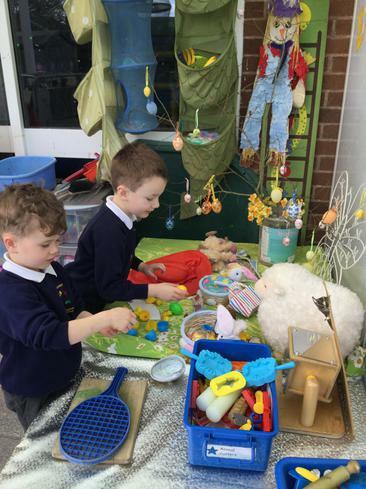 This half term our RE week focus has been Easter. 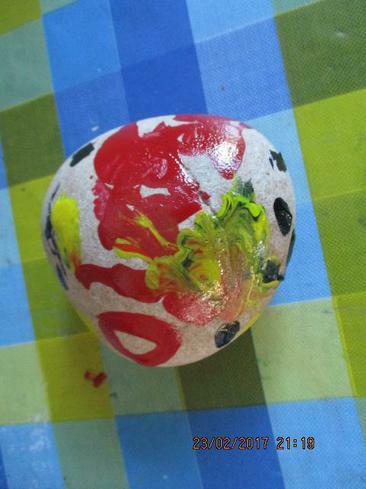 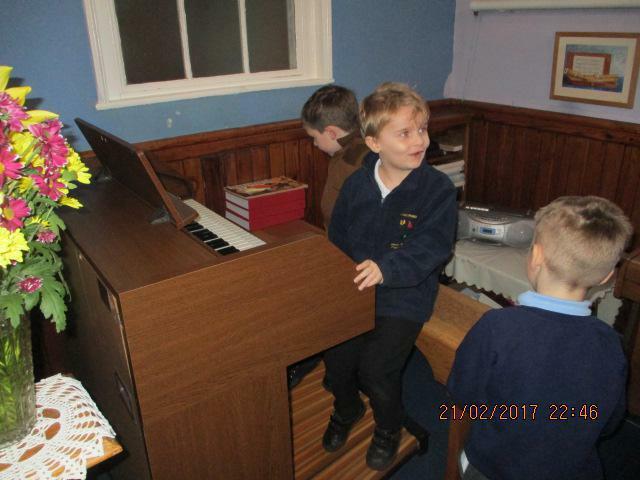 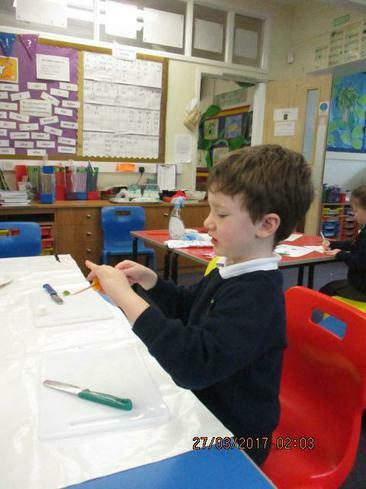 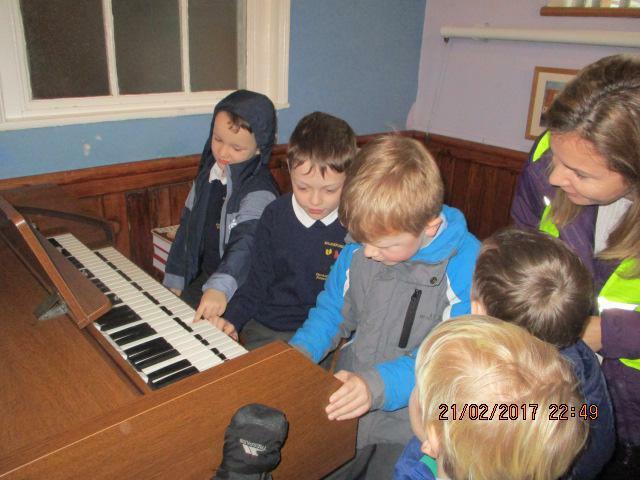 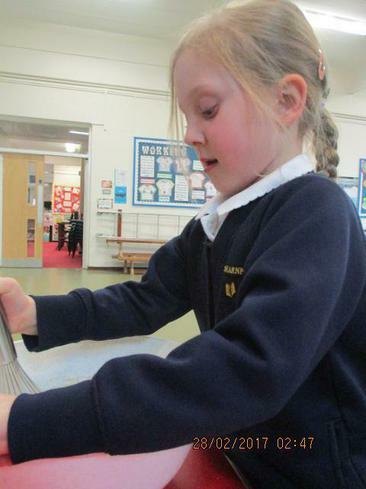 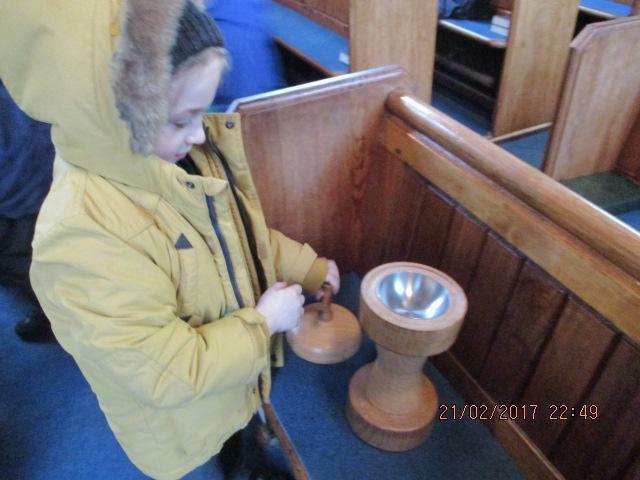 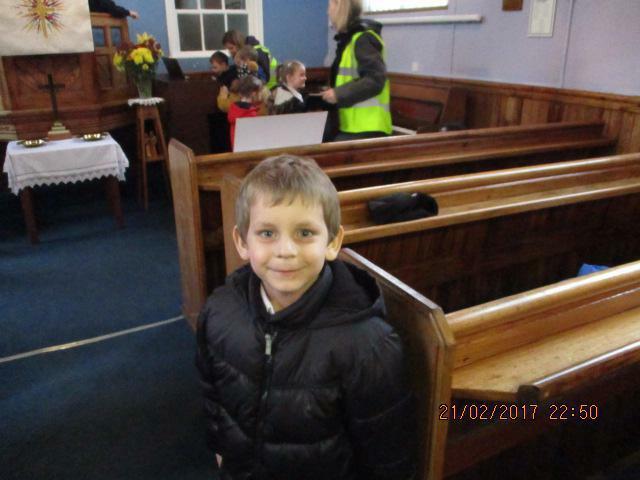 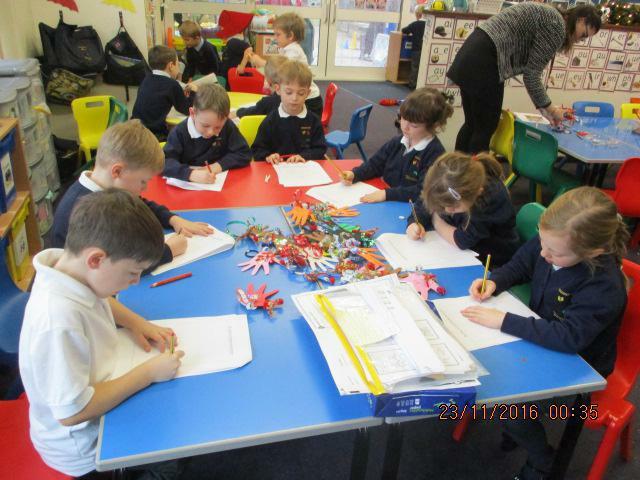 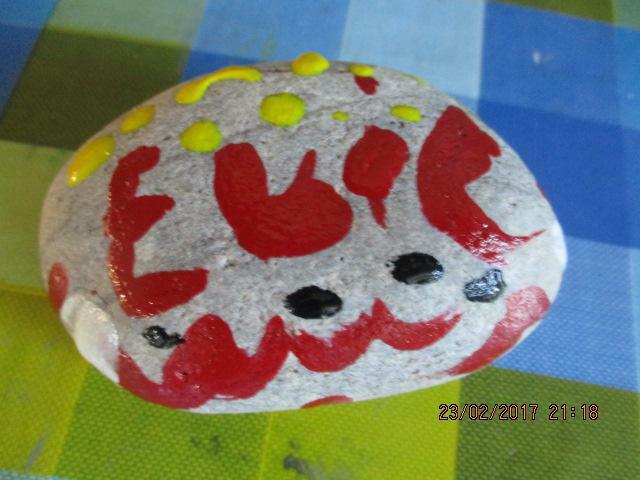 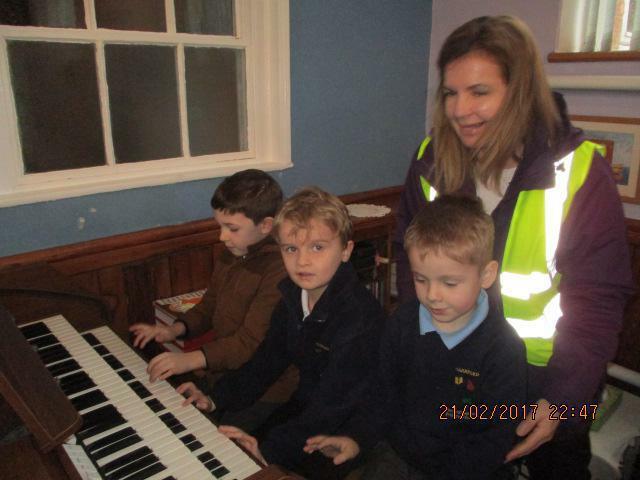 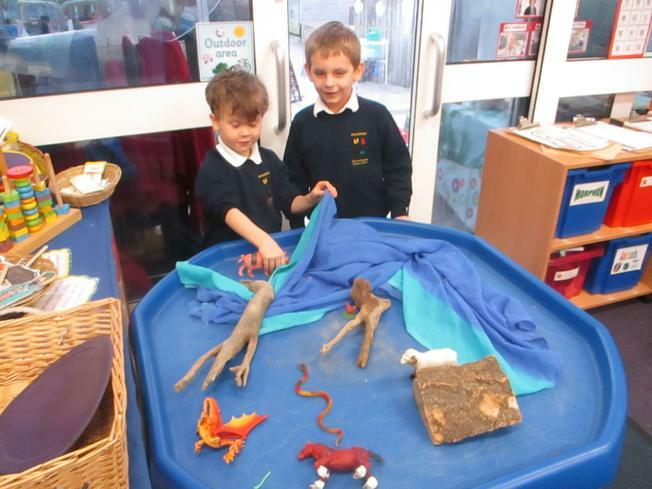 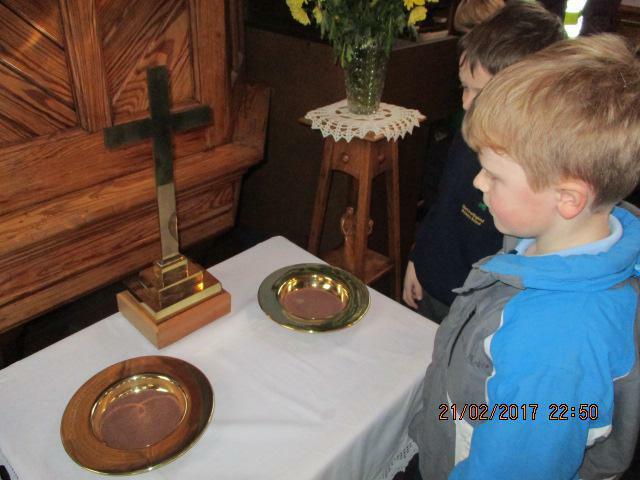 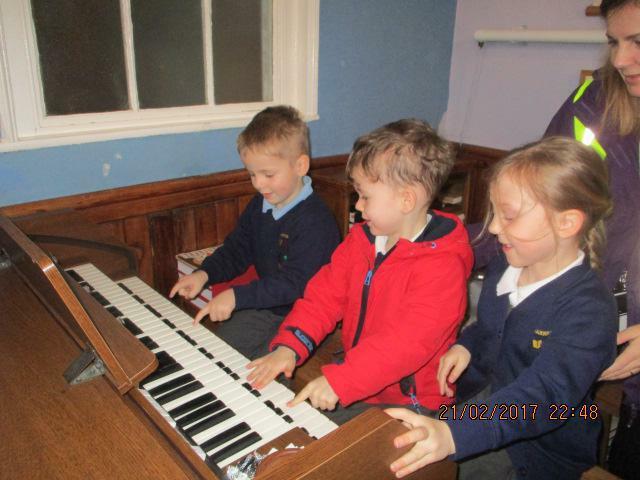 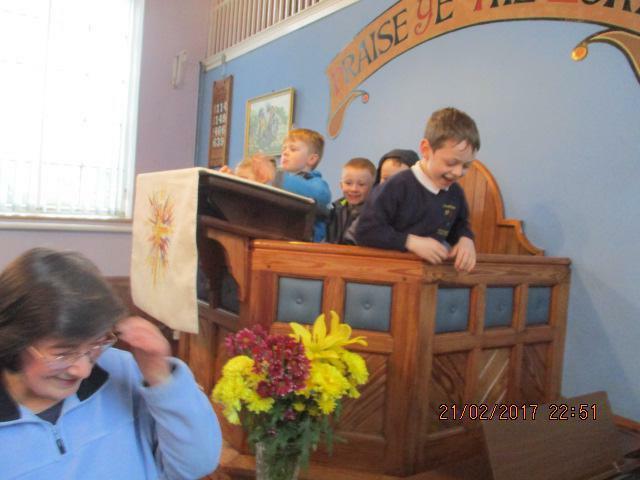 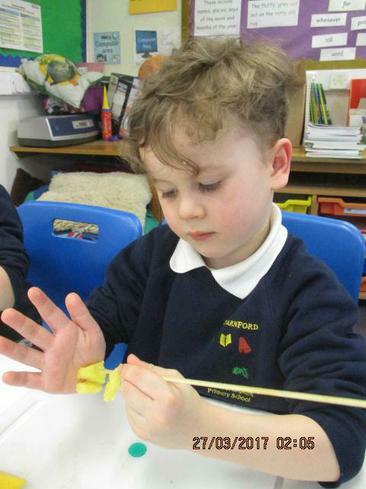 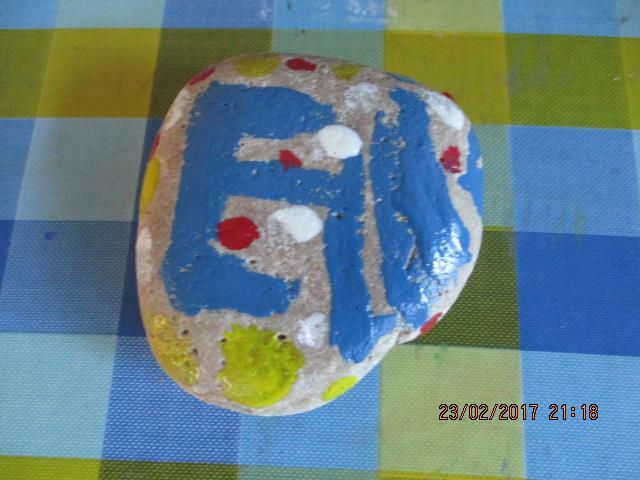 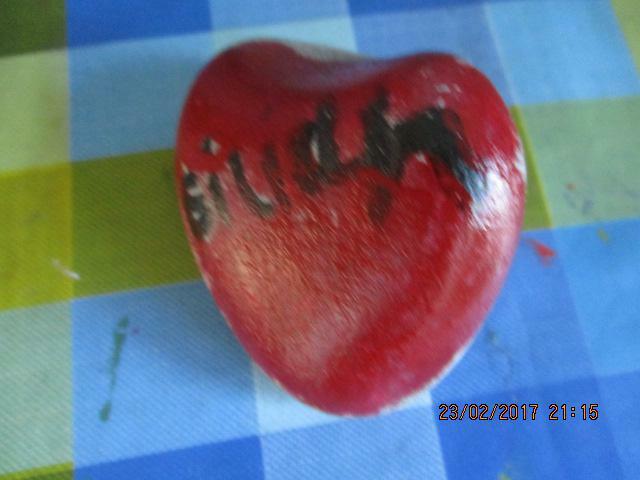 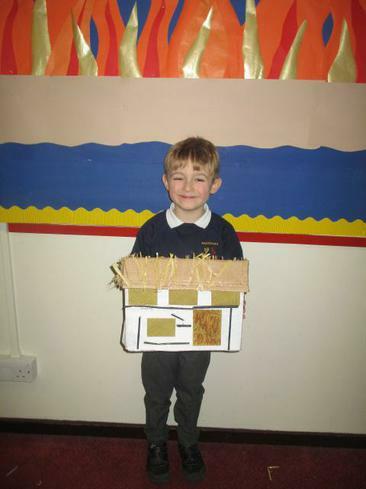 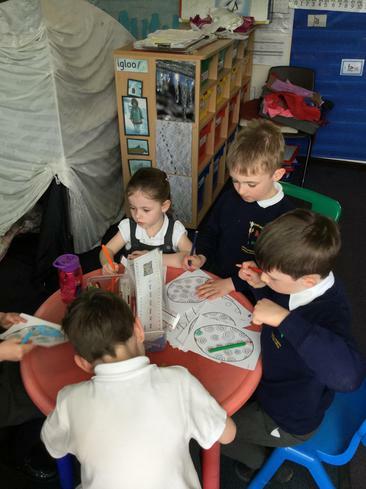 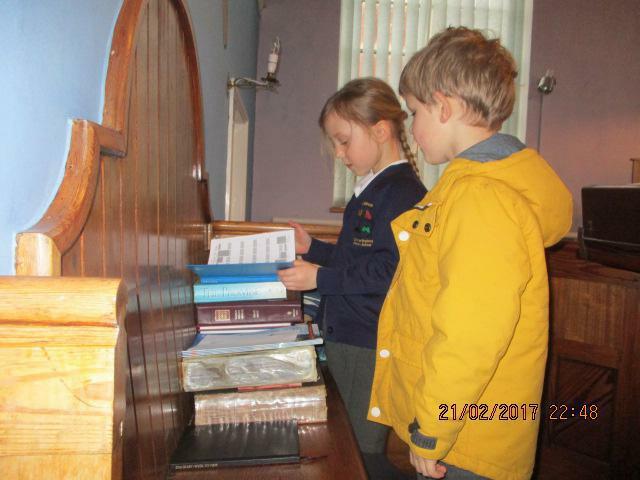 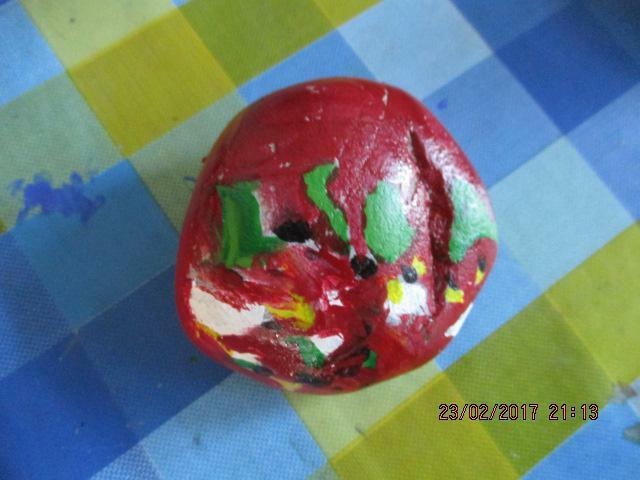 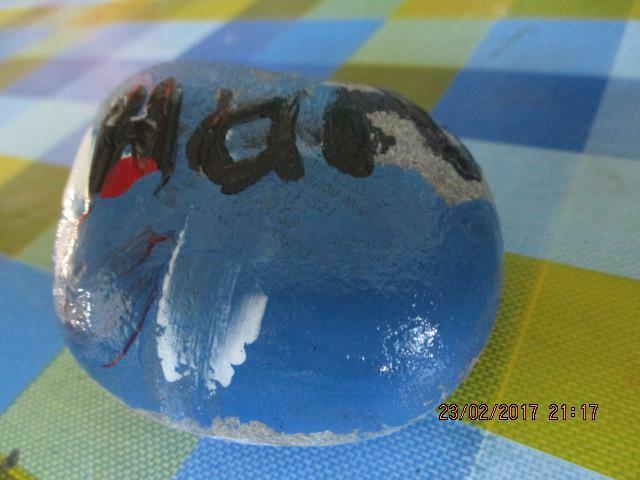 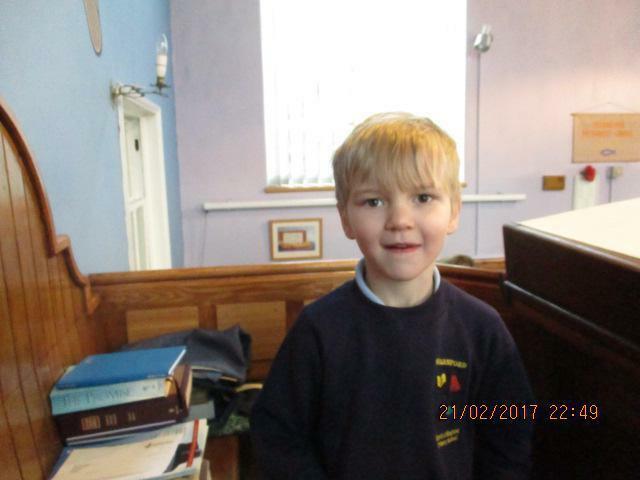 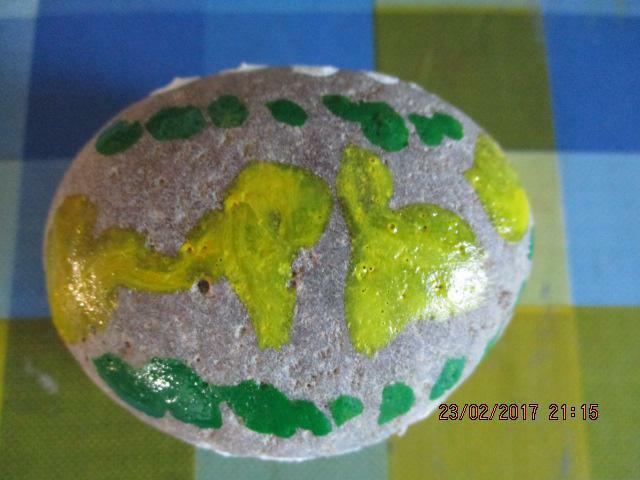 The children have explored the Easter story through a variety of different activities. 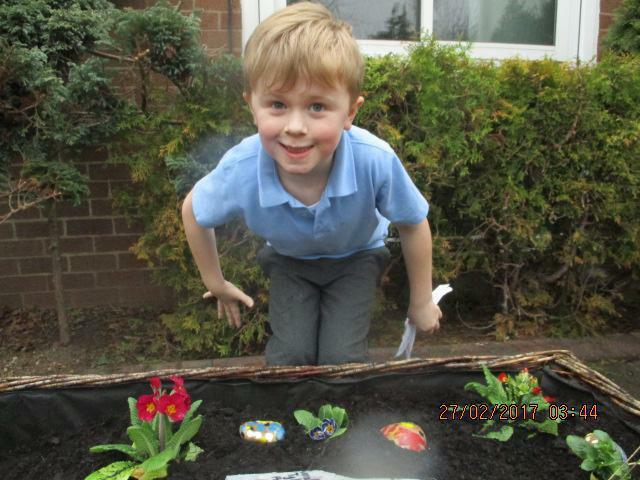 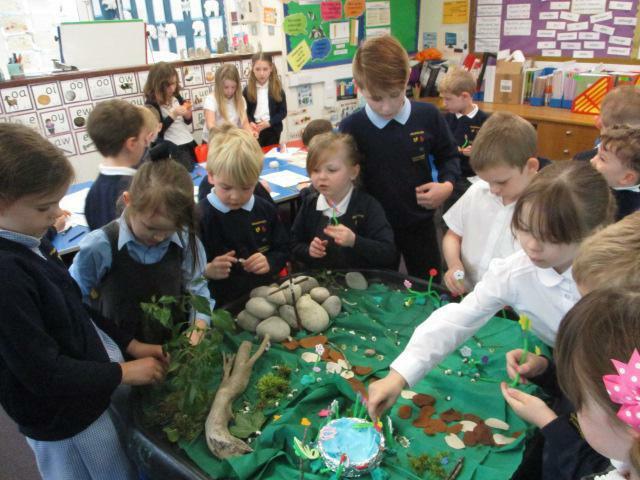 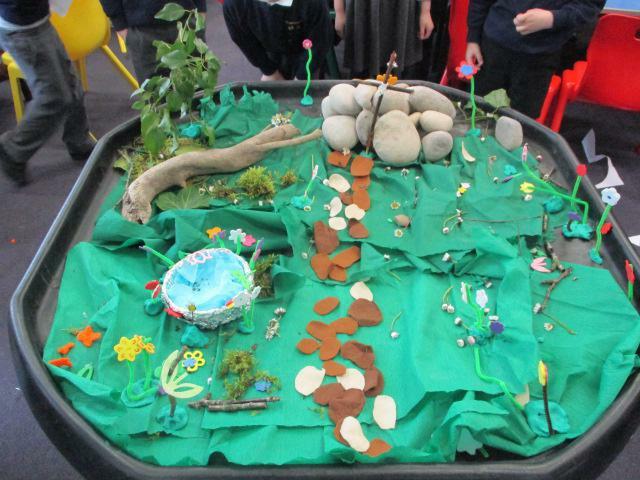 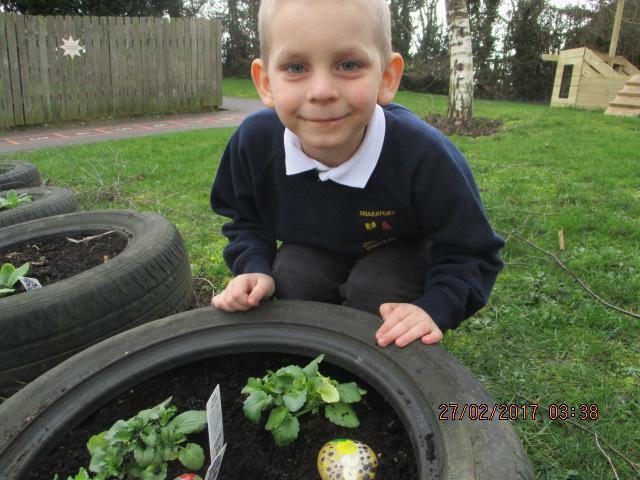 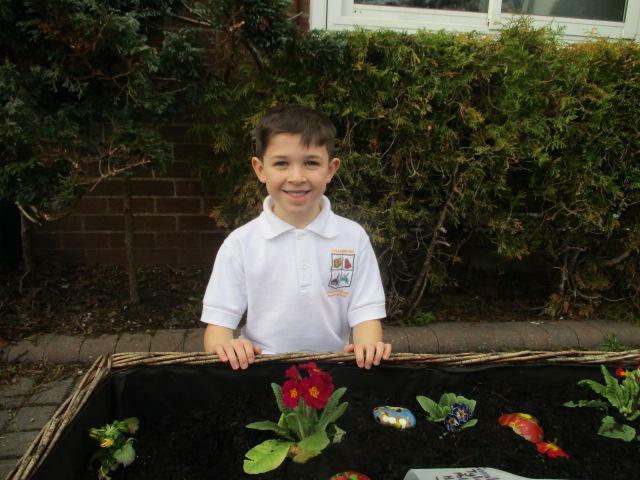 We made our own class Easter garden and discussed why an Easter garden is special to Christians. 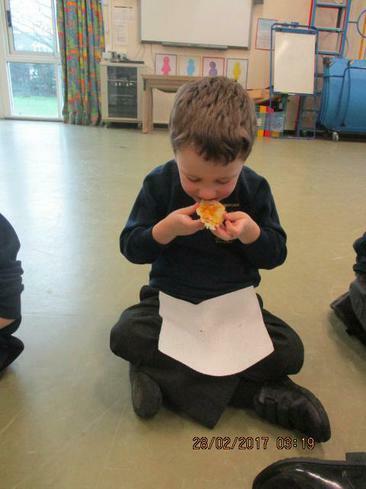 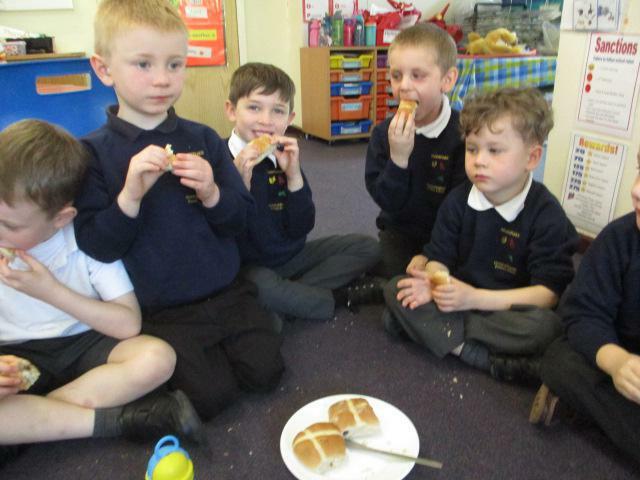 We ate hot cross buns and discovered what they represent as well as making Easter cards. 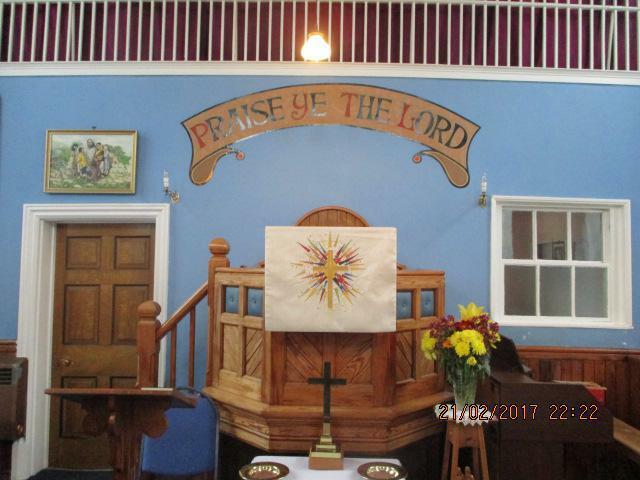 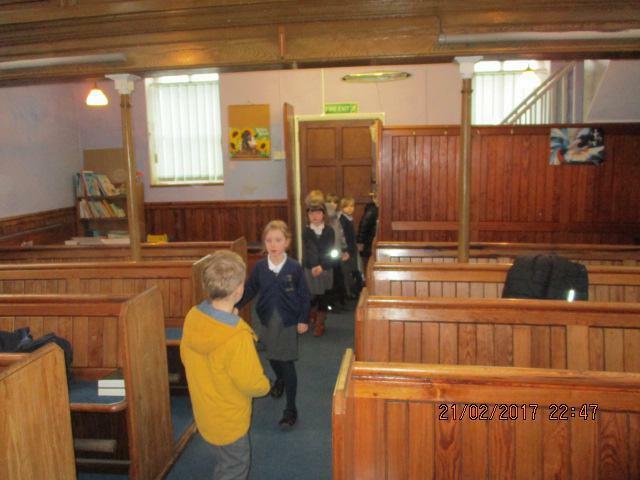 Finally, we enjoyed walking down to St Helen’s church to take part in our annual Easter Service. 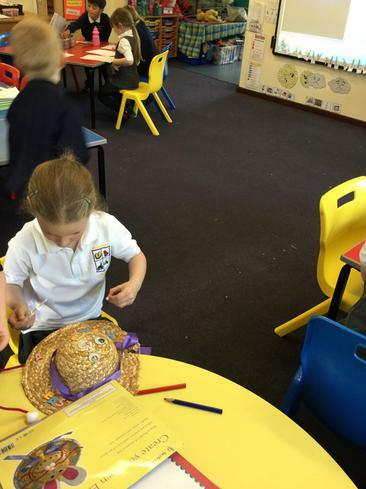 As part of International Afternoon we spent time learning about other nations around the world. 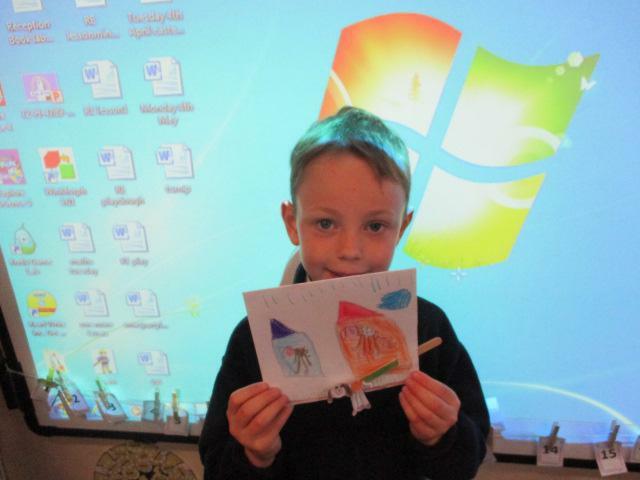 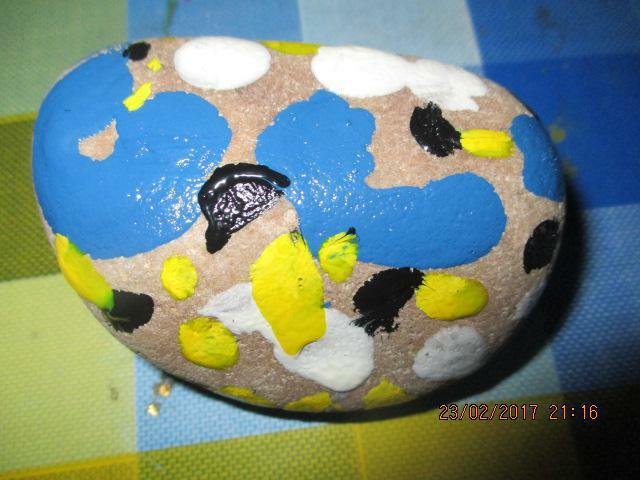 Our main focus was Africa. 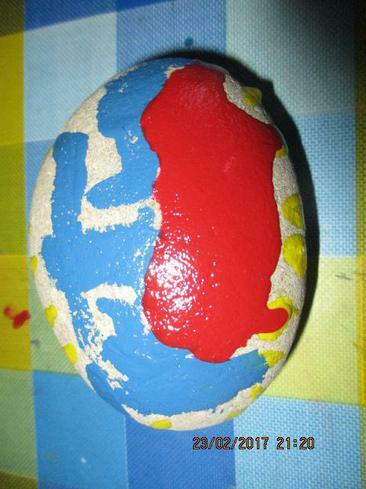 We found Africa on a globe and world map. 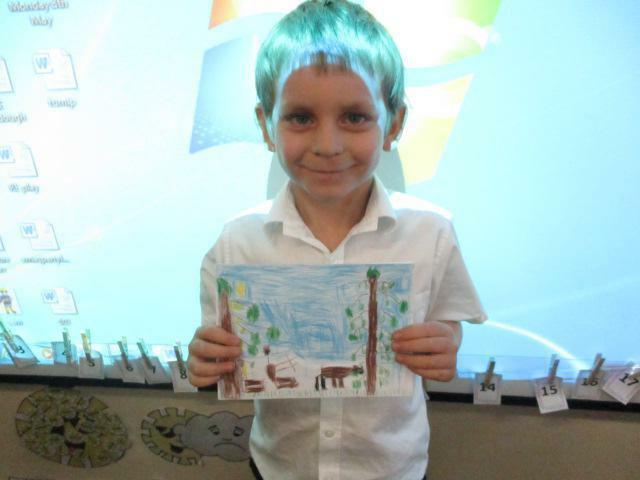 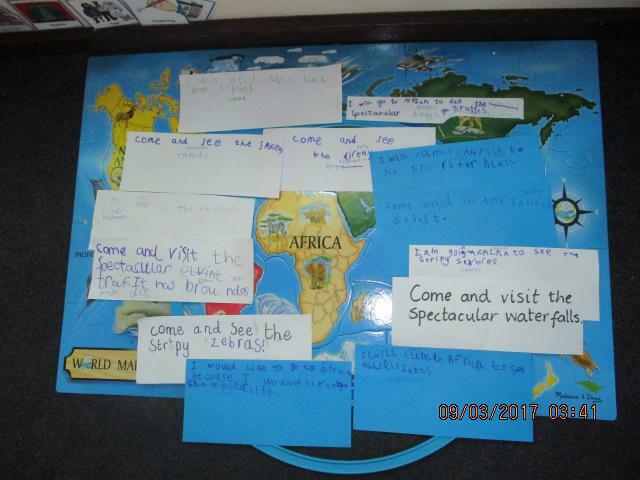 We found out some very interesting facts about Africa such as its' animals, people, famous landmarks and rivers. 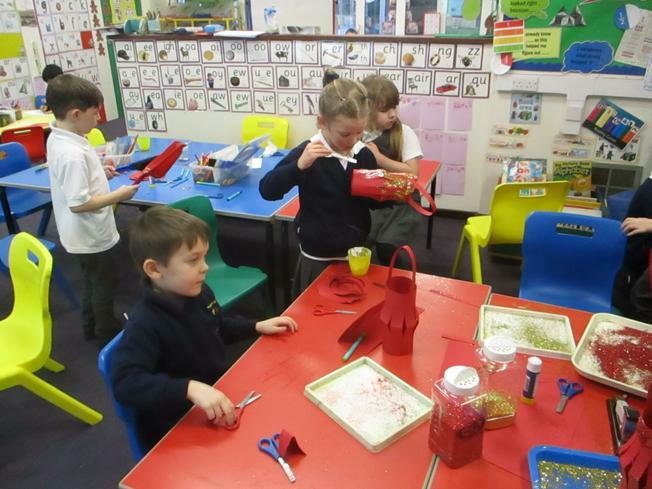 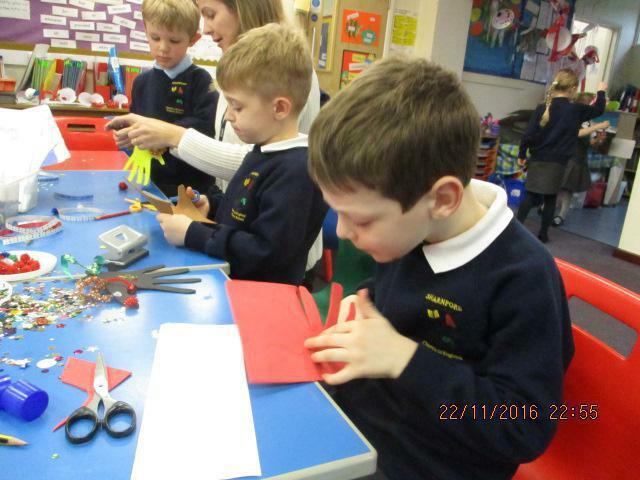 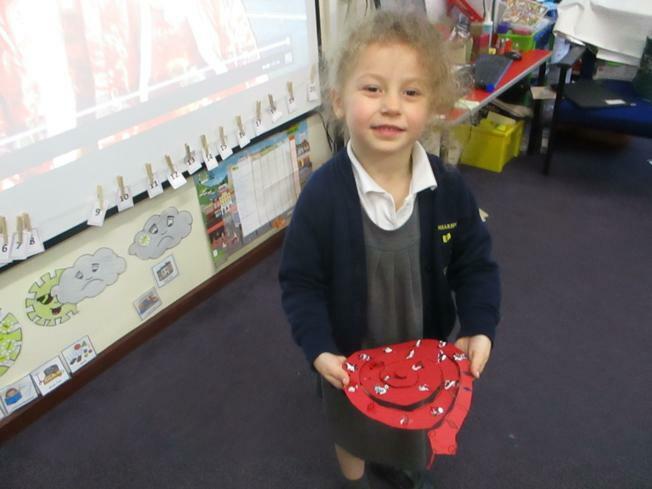 Reception children made their own African musical instruments. 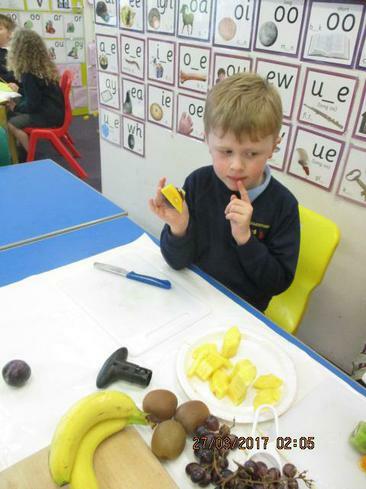 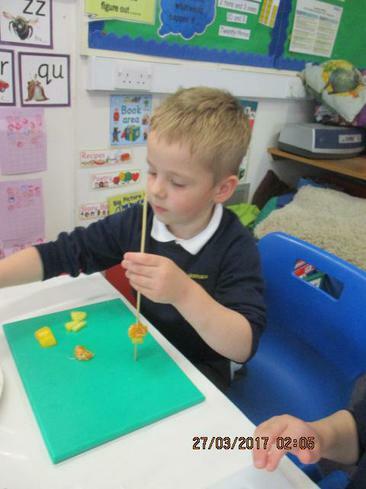 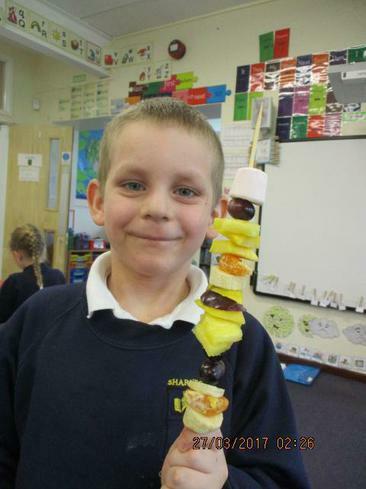 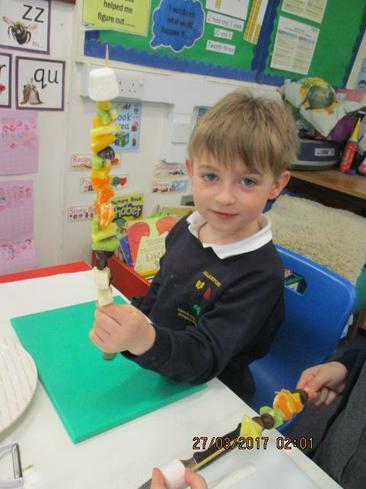 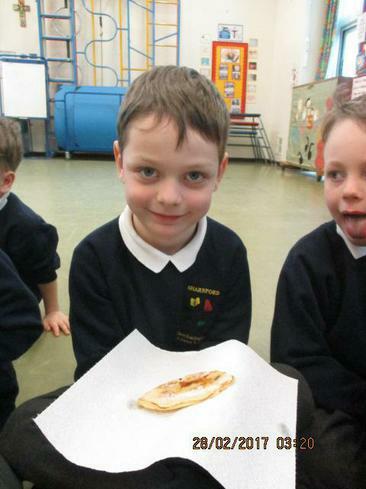 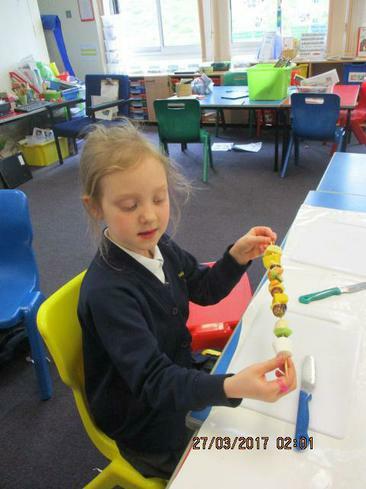 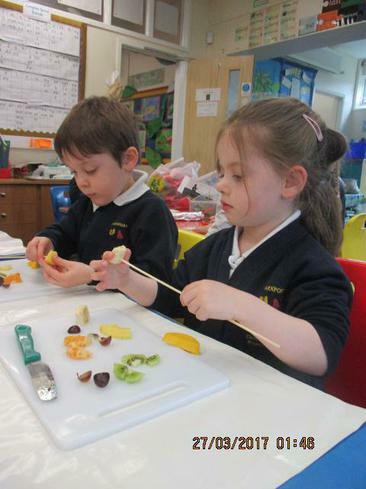 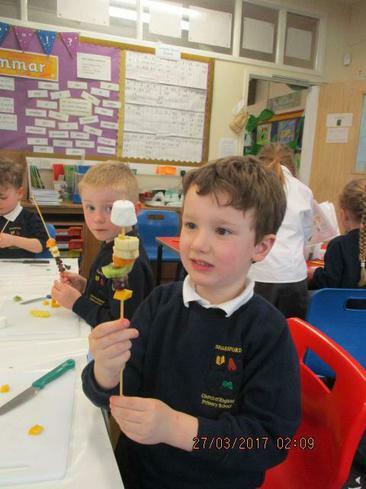 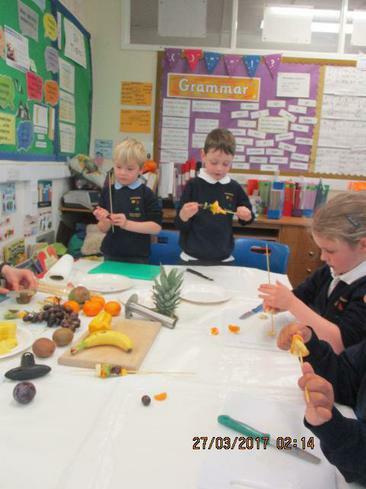 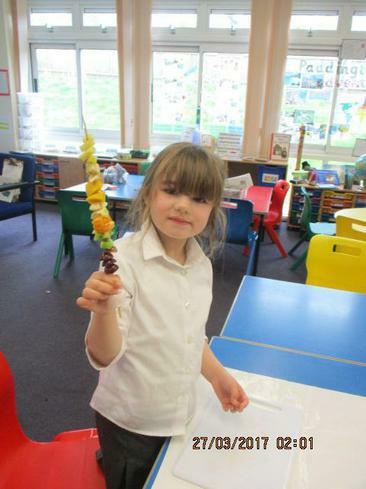 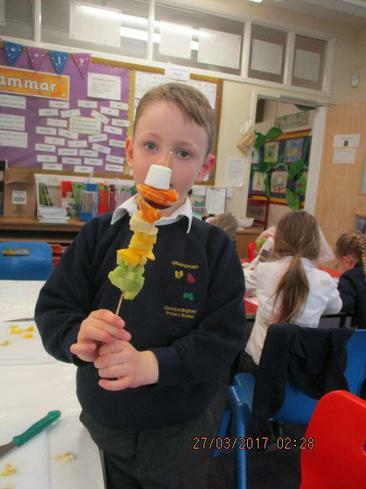 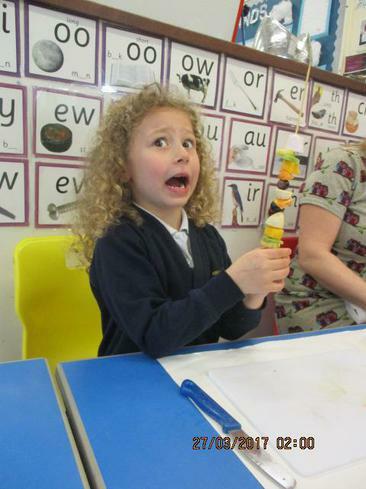 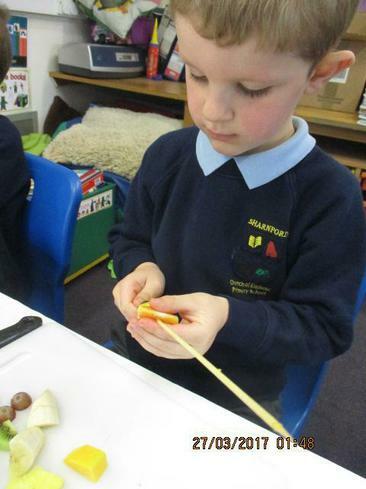 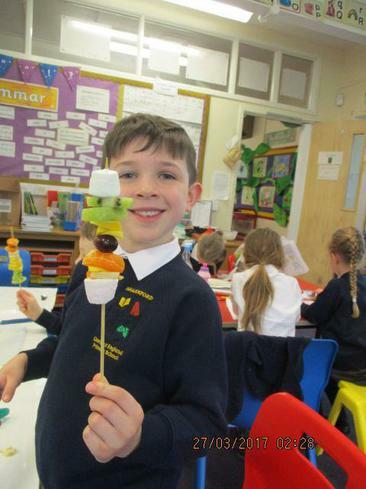 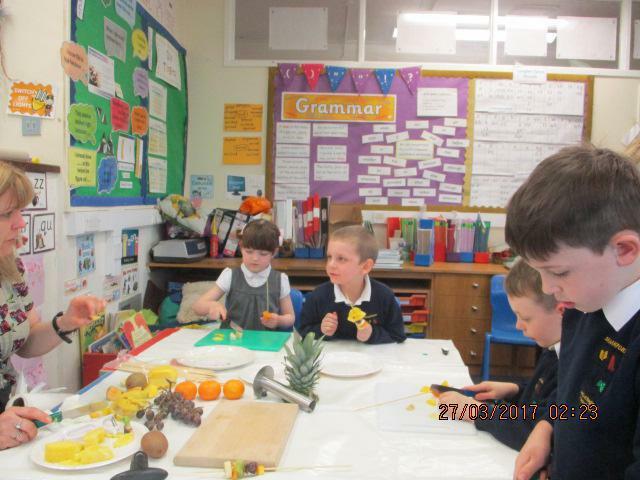 We also made tropical fruit kebabs based on the story 'Handa's Surprise'. 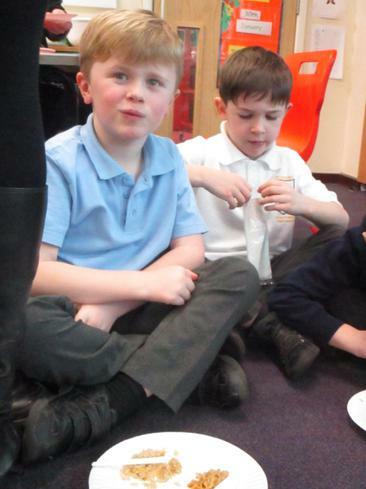 Finally, we talked about the importance of people being respectful, no matter who they are or where they come from. 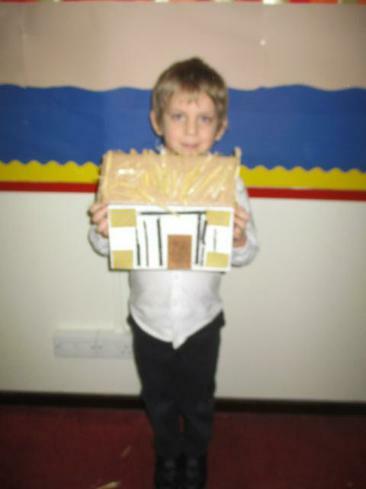 As part of our RE work on special places, Willow Class have designed and made their own special area. 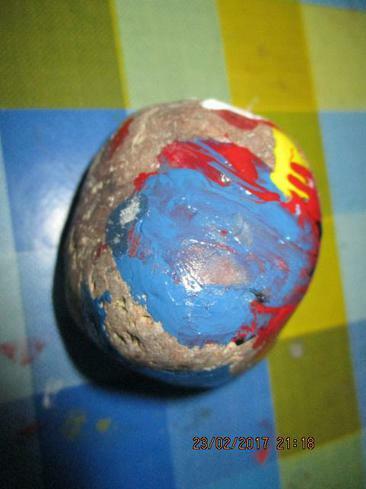 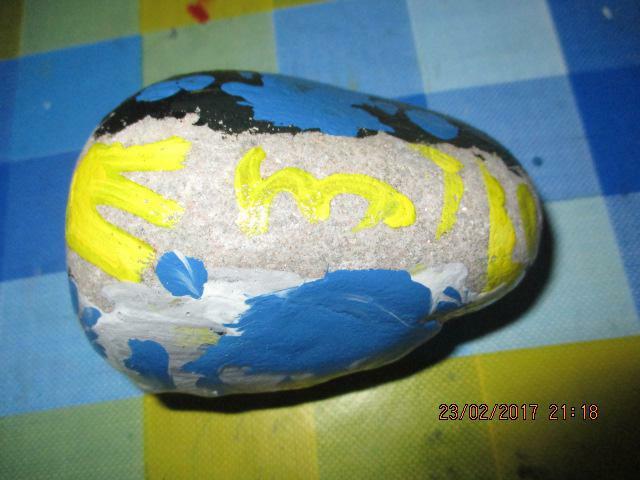 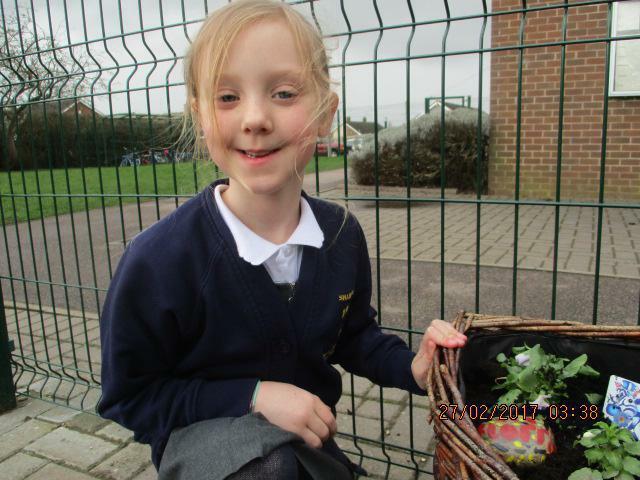 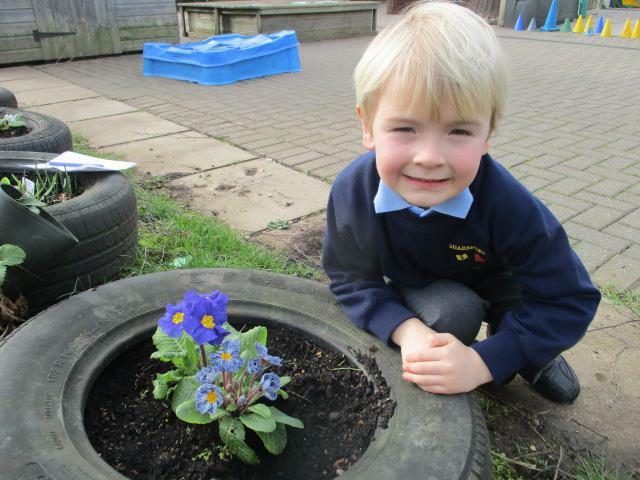 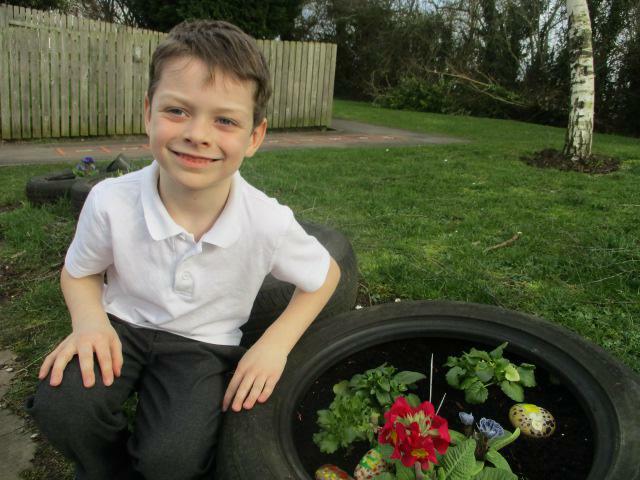 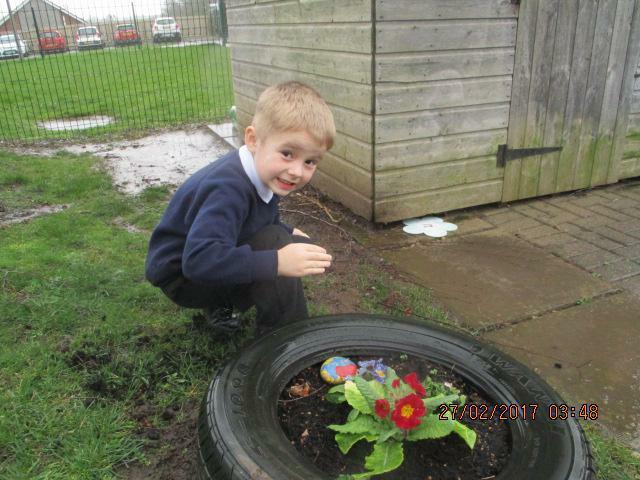 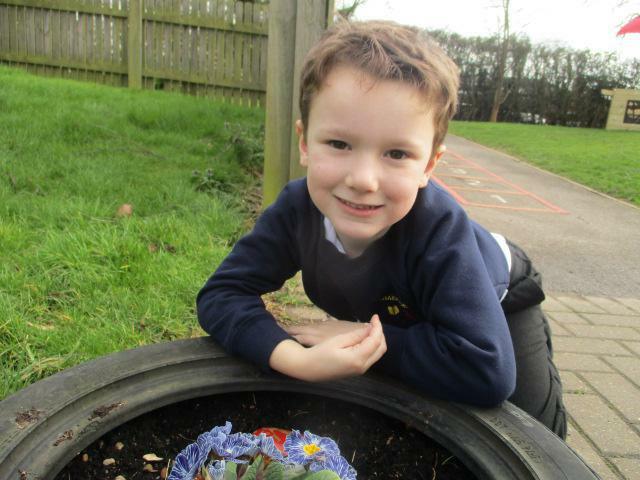 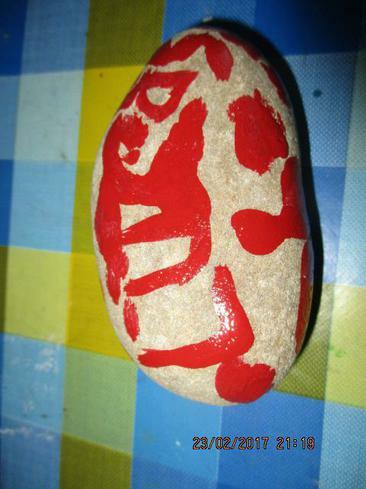 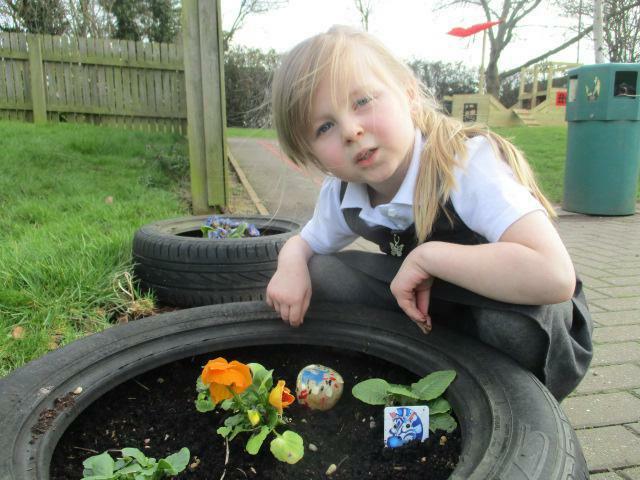 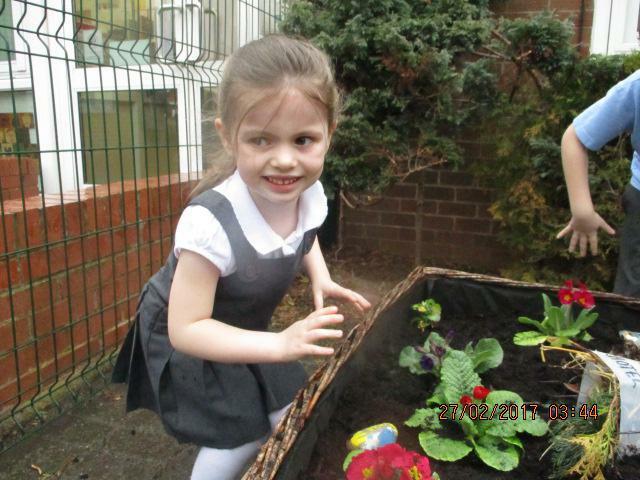 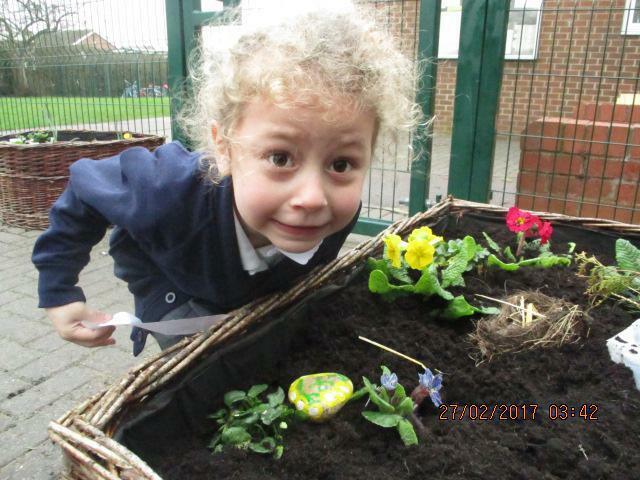 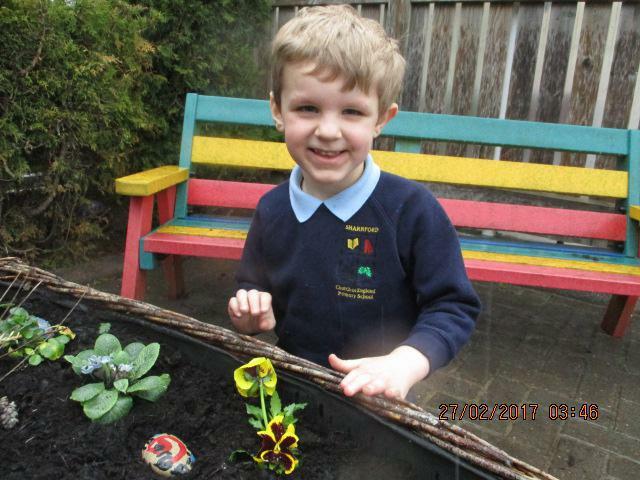 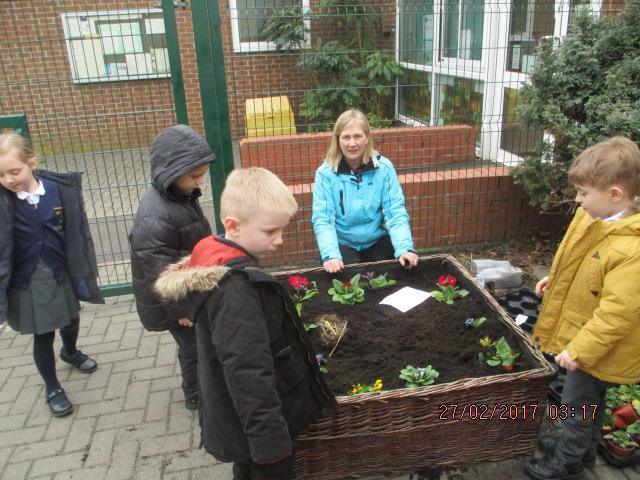 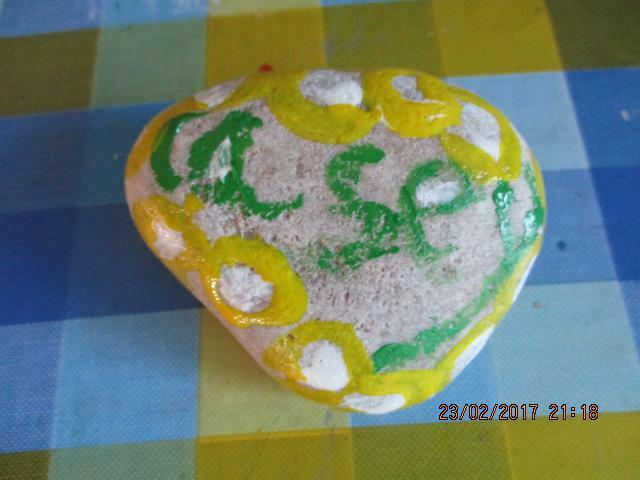 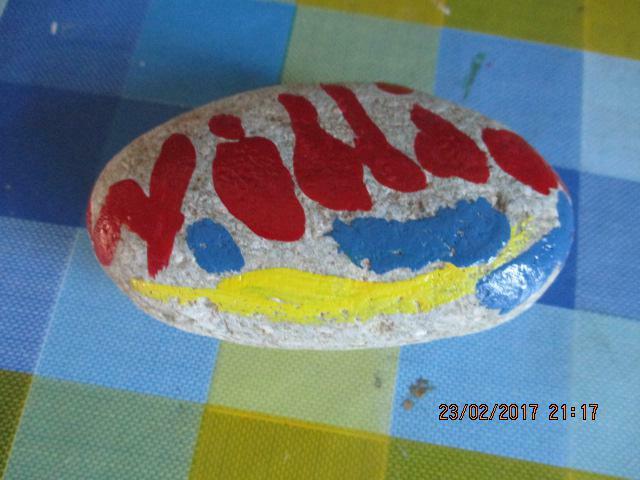 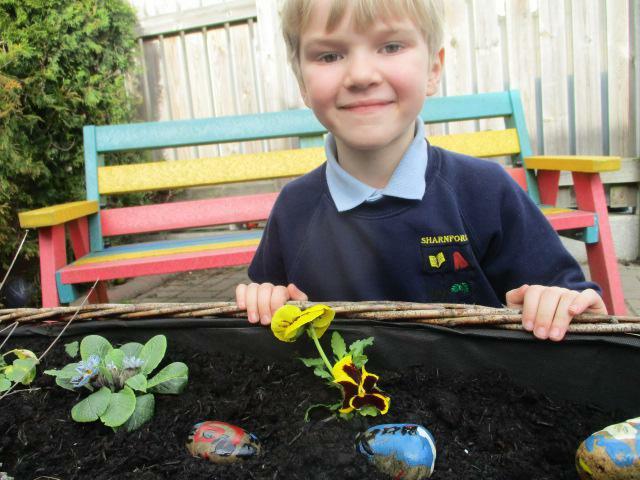 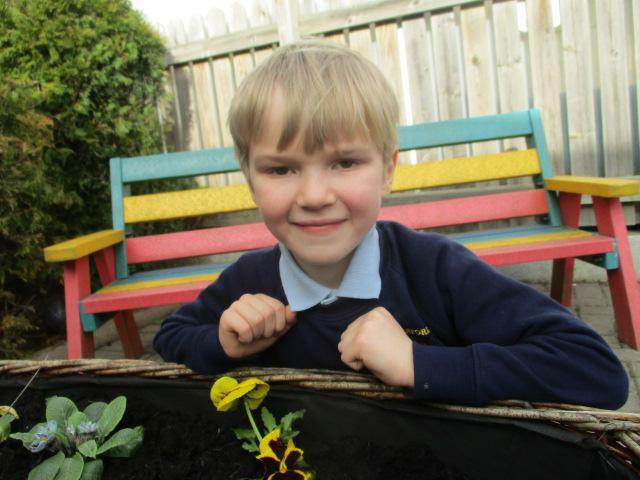 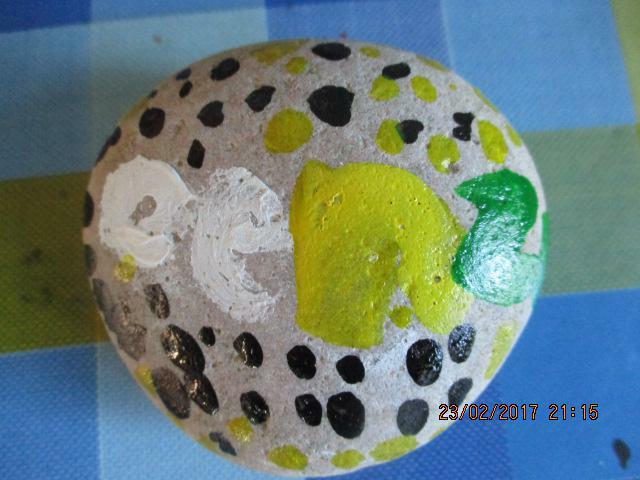 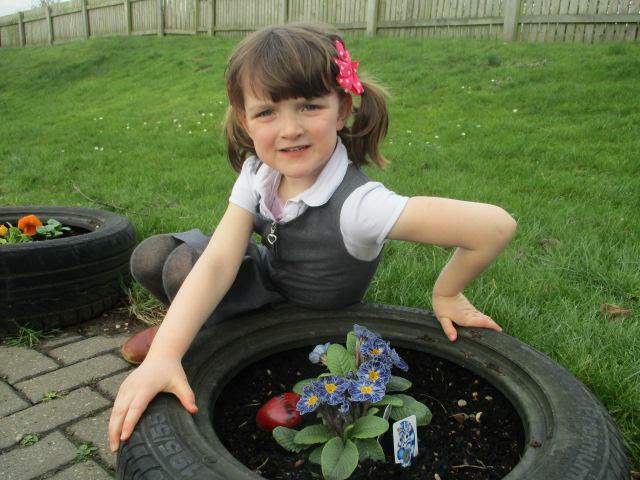 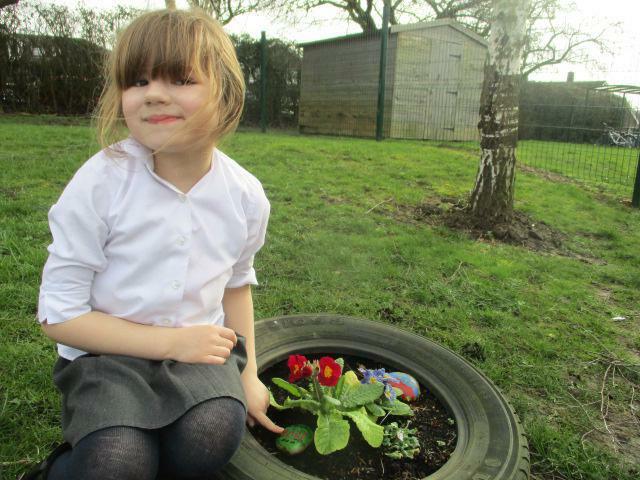 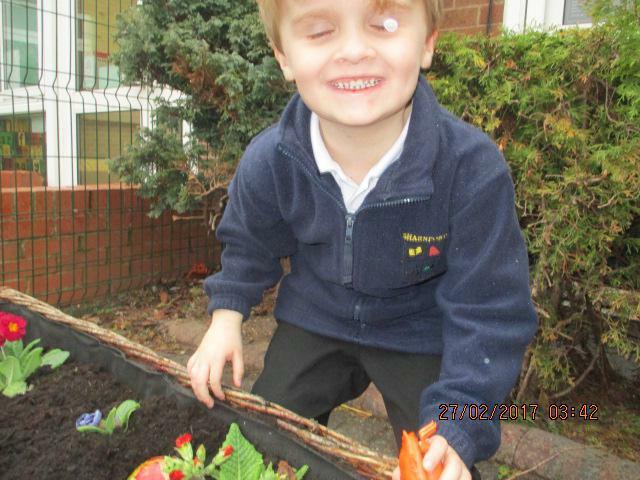 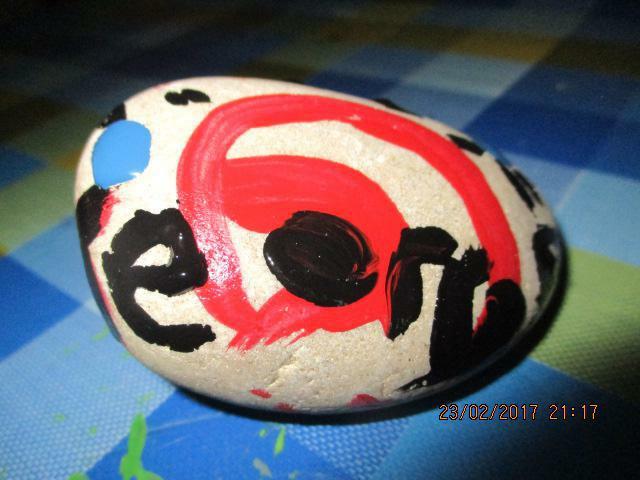 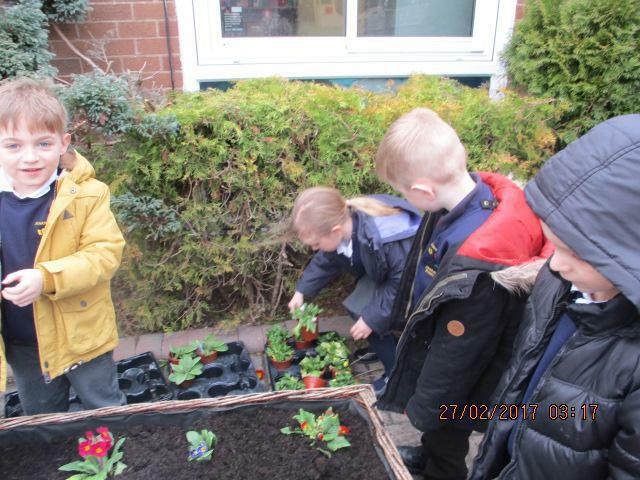 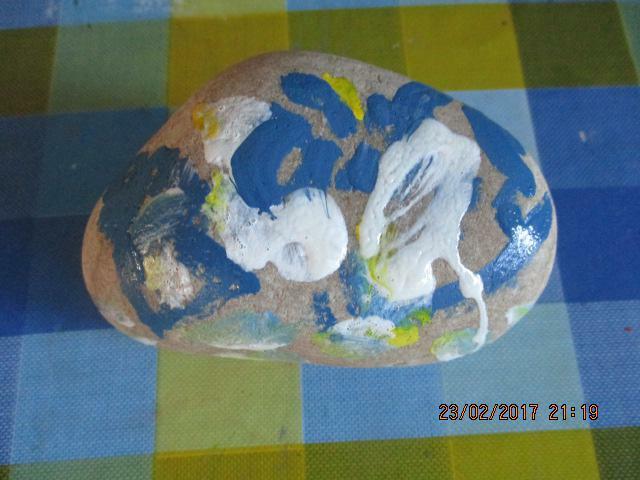 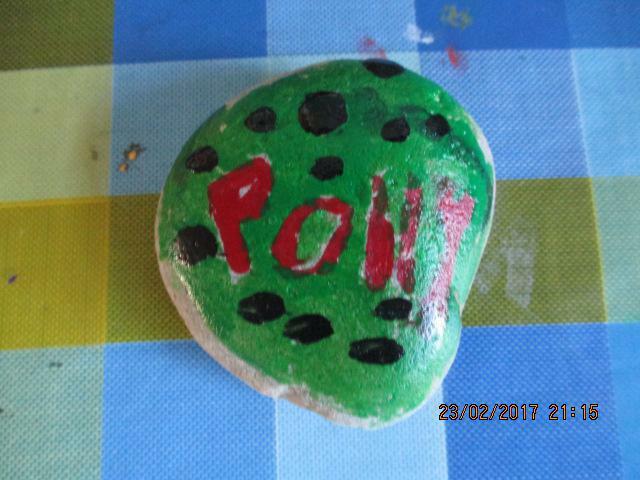 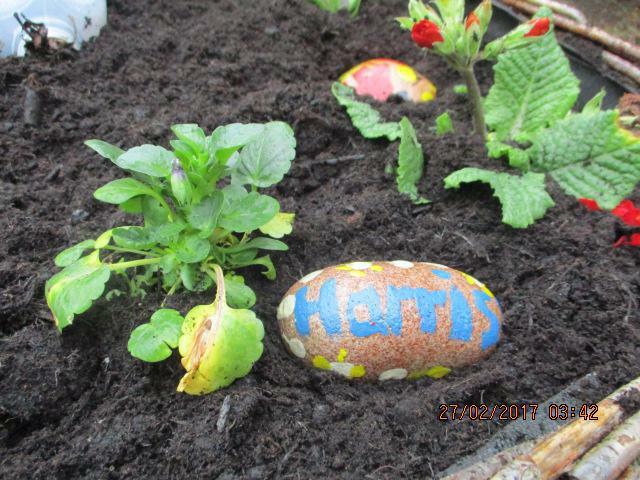 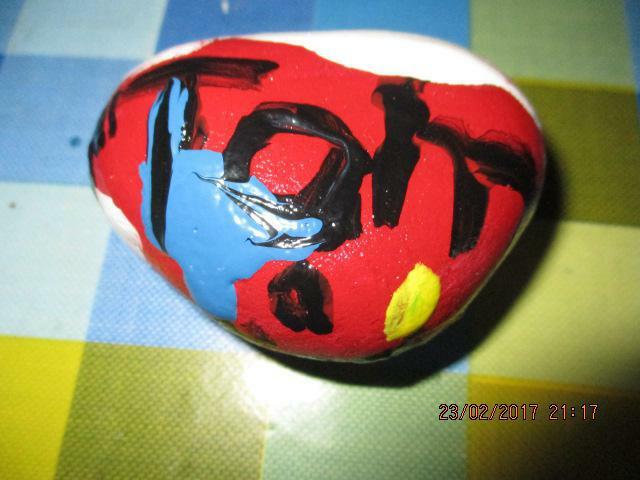 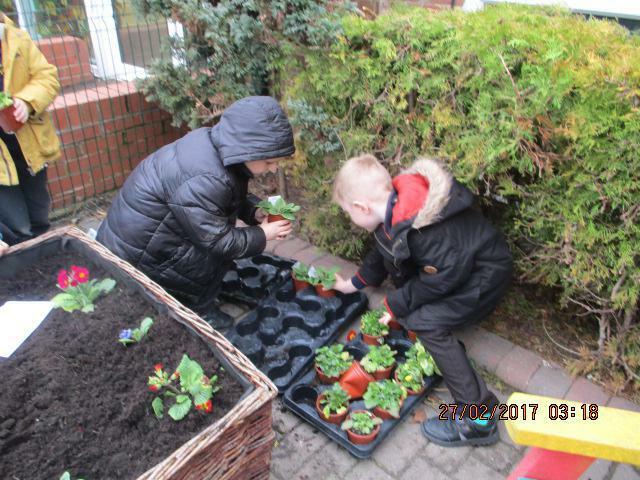 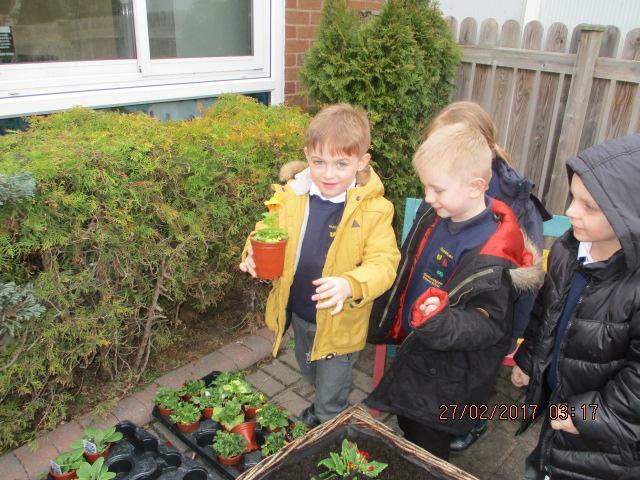 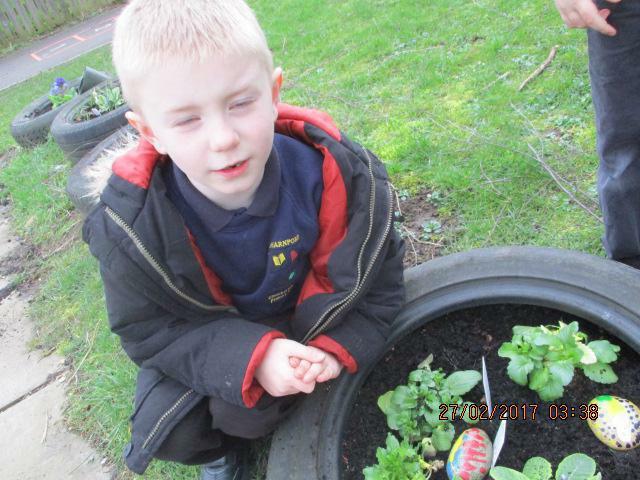 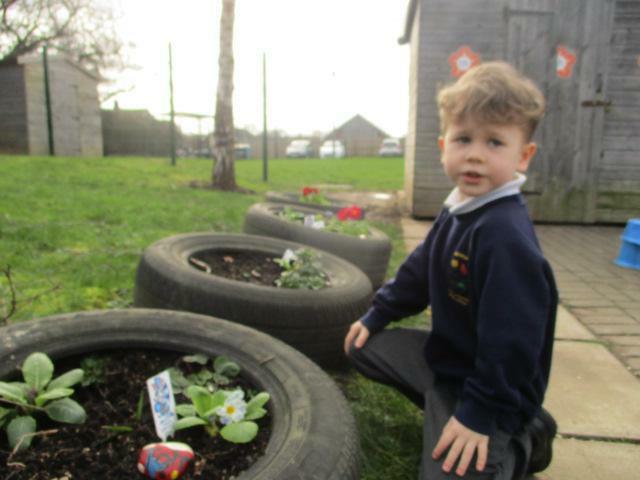 The children have made their own peace garden and have planted pansies, primroses and bulbs and have decorated their own special pebbles to place inside the planters. 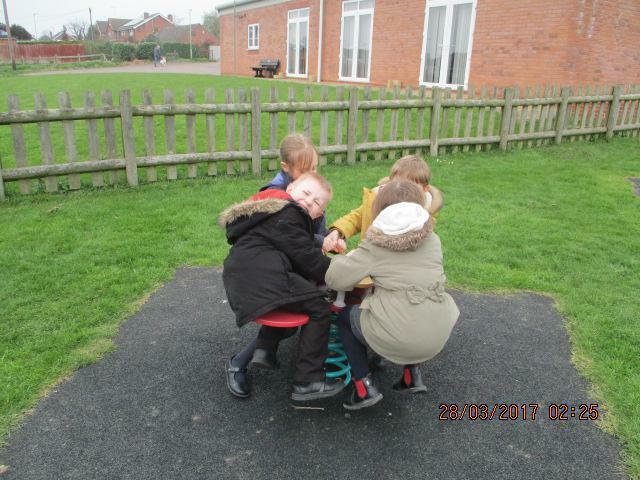 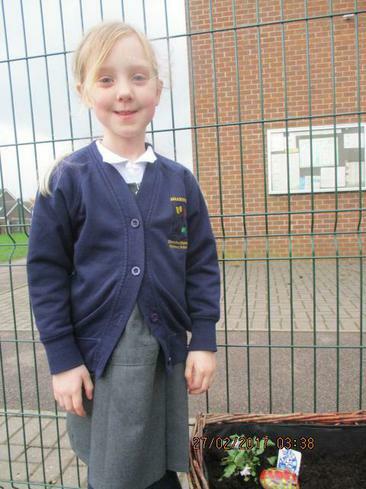 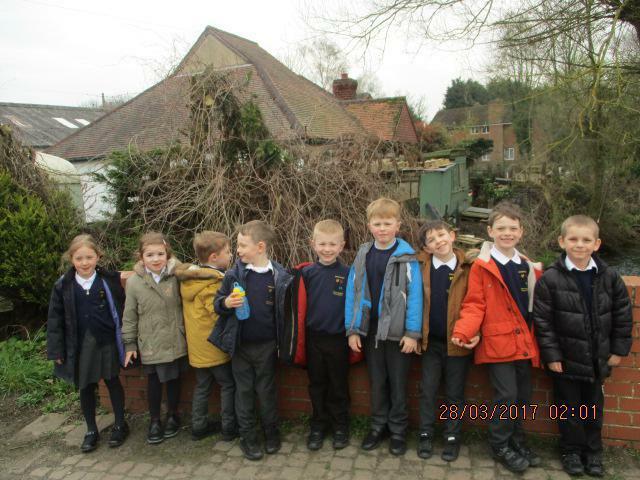 Reception children have also made bug hotels so that the insects also have a special place to go and they will continue to make things to add to the peace garden over the coming weeks. 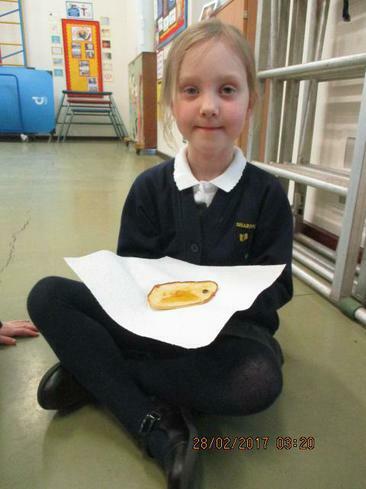 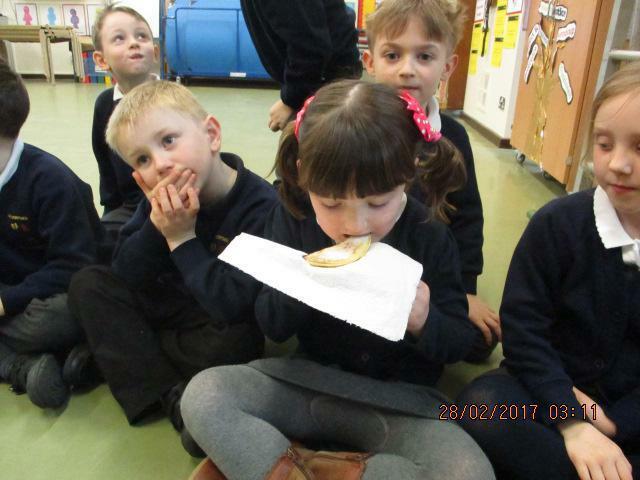 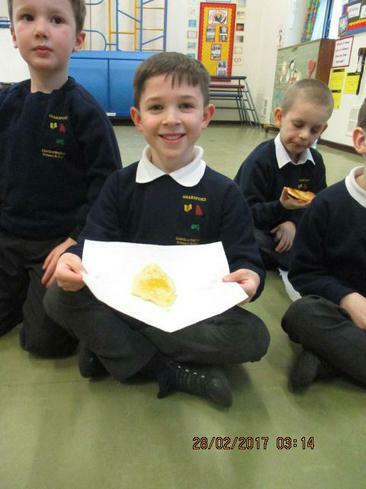 Today we celebrated Shrove Tuesday. 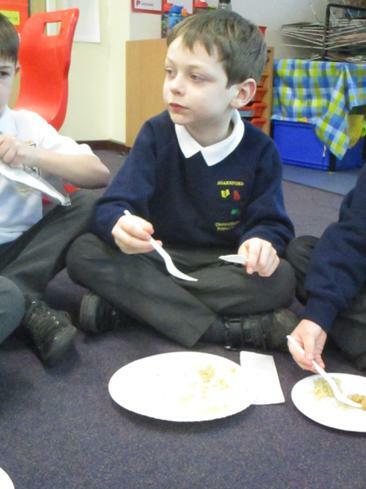 We talked about what Shrove Tuesday is and why we celebrate it. 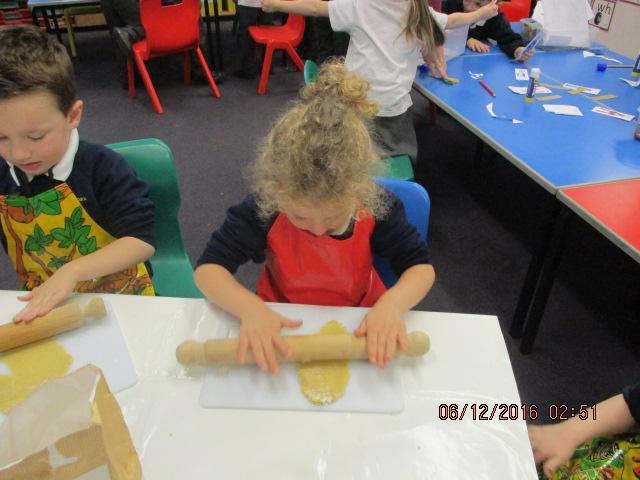 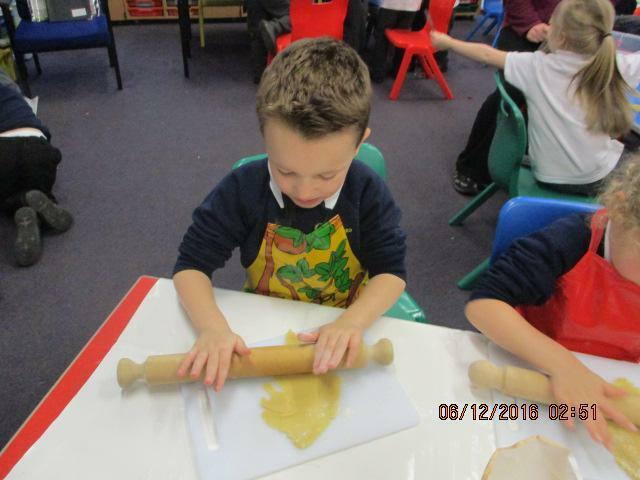 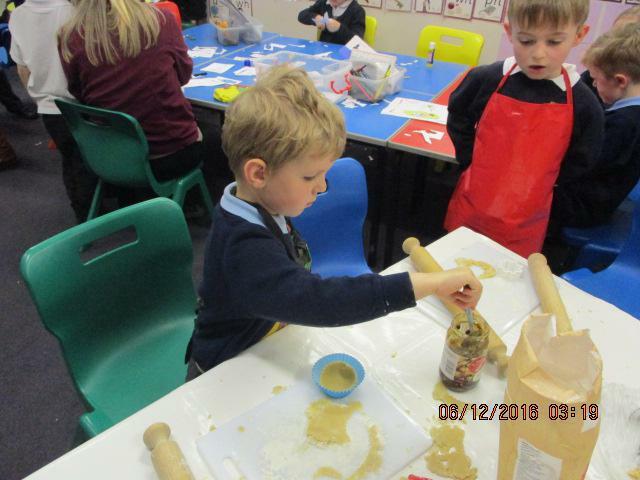 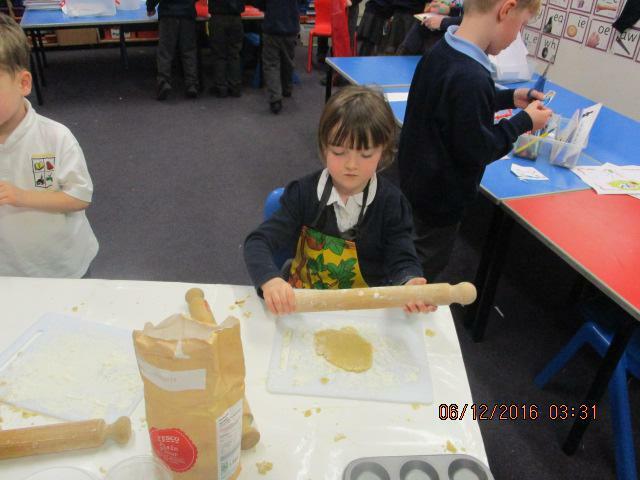 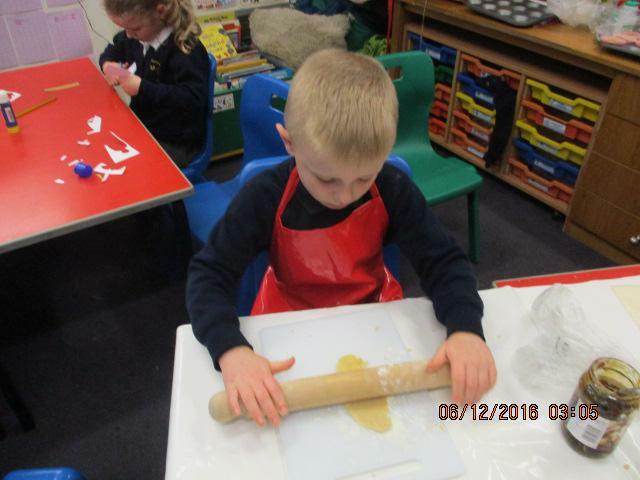 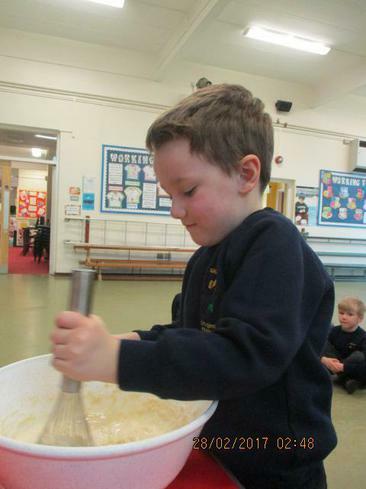 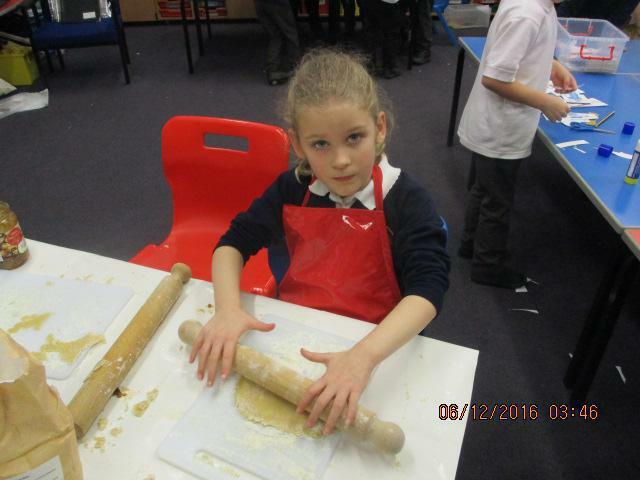 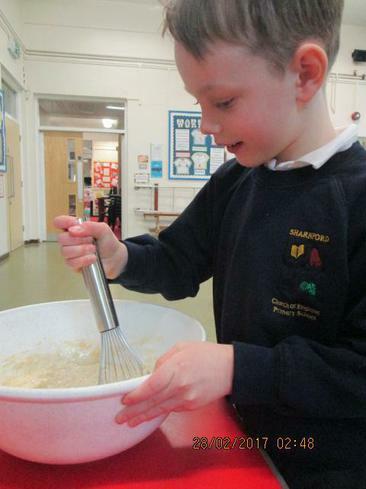 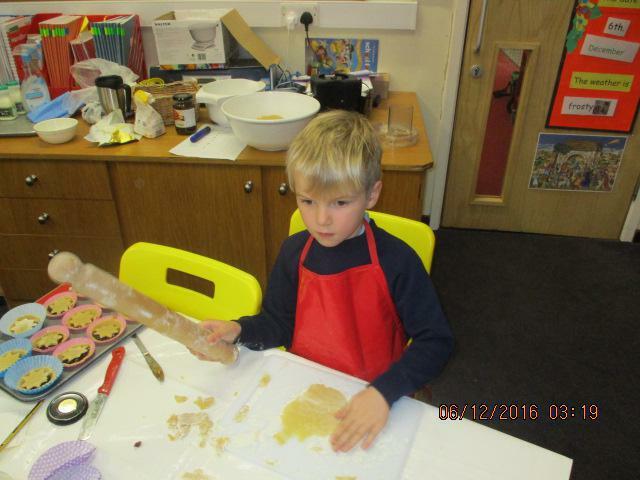 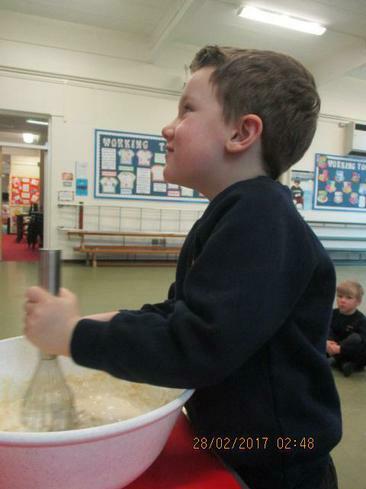 We then followed a recipe and made some tasty pancakes. 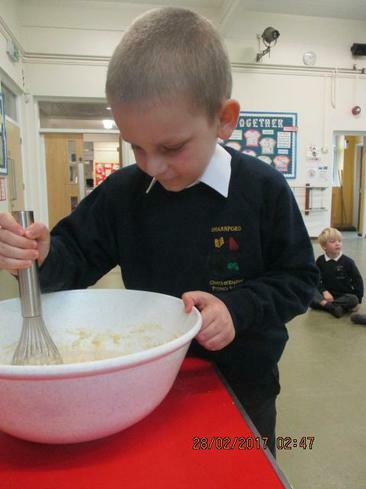 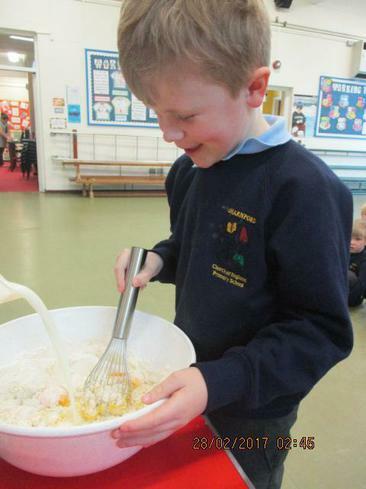 We helped to add the ingredients and mix them together then watched Mrs Wright cook them. 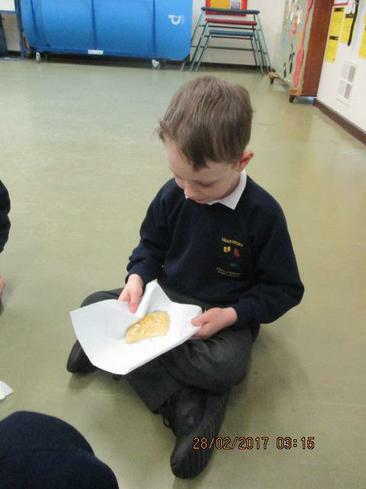 We were given a variety of toppings to put on our pancakes which we all thought were delicious. 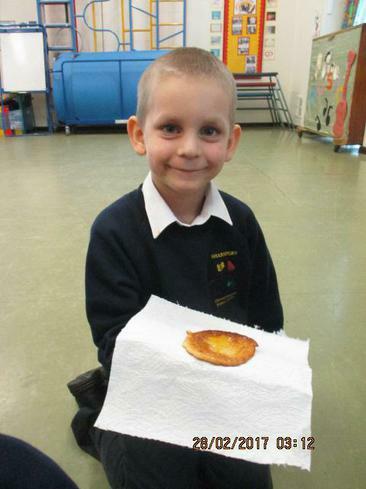 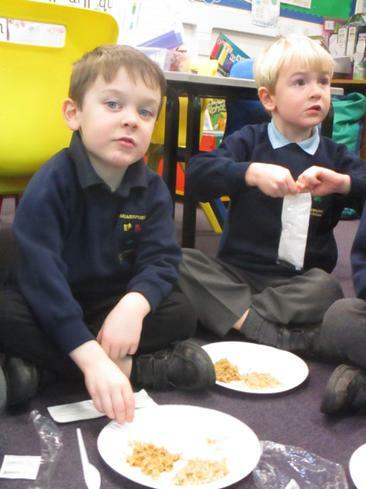 Finally, we finished the lesson by listening to the story, ‘Mr Wolf’s Pancakes’. 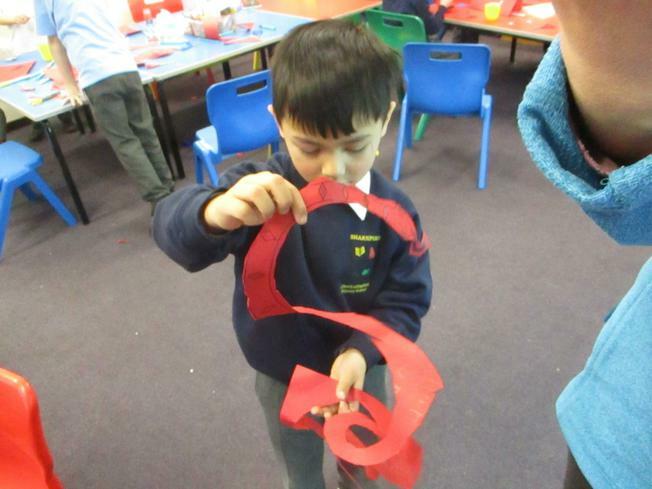 Today Willow children enjoyed finding out all about Chinese New Year. 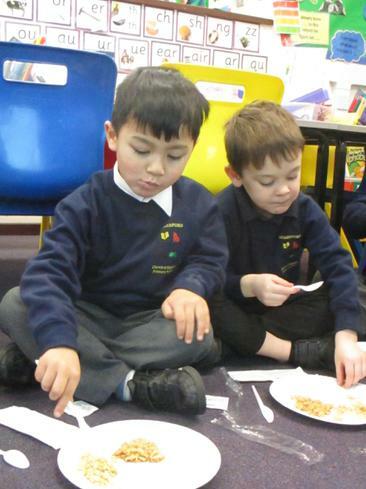 We turned the role-play area into a Chinese Restaurant and decorated it traditionally. 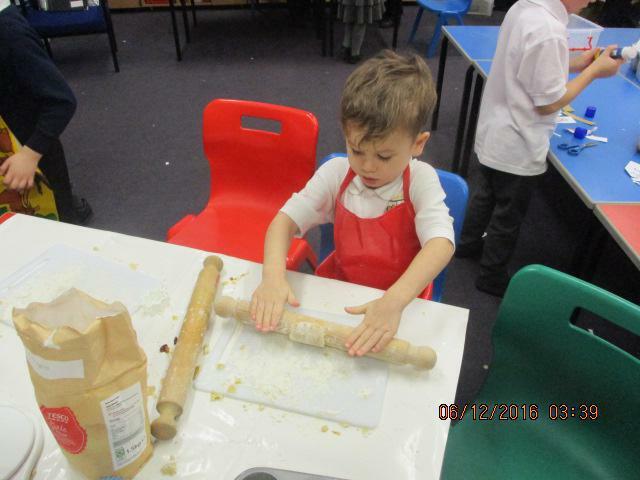 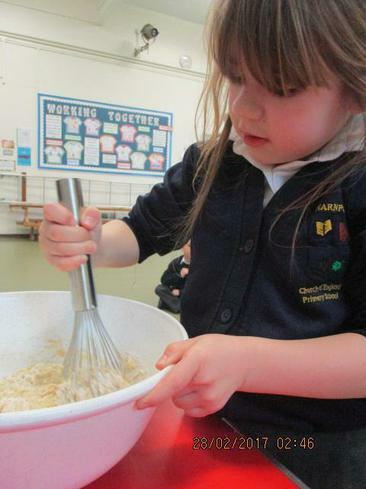 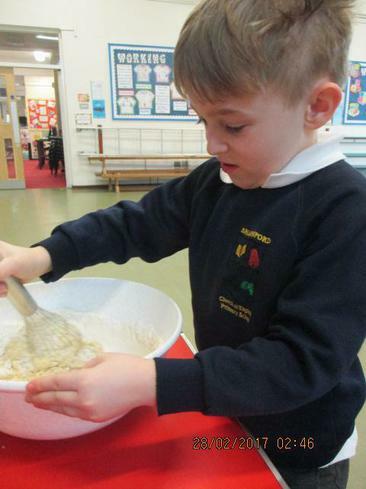 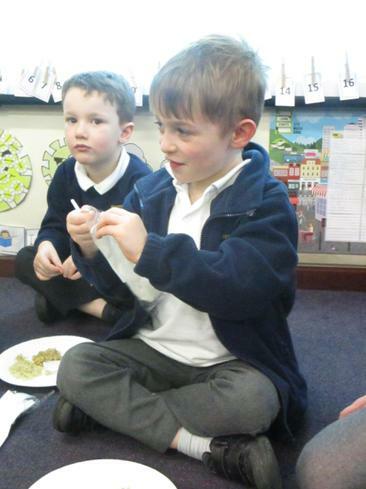 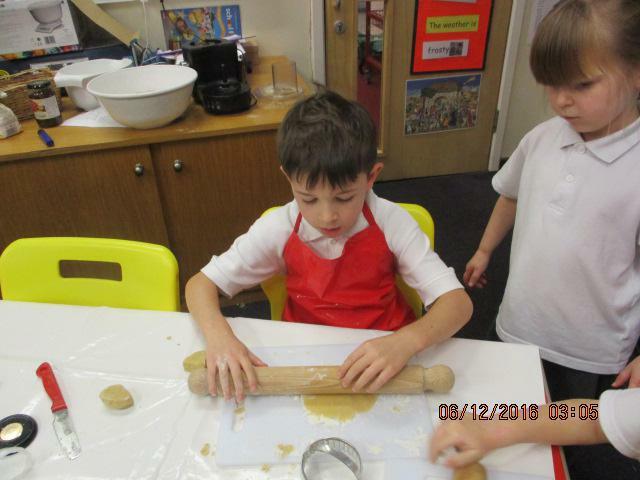 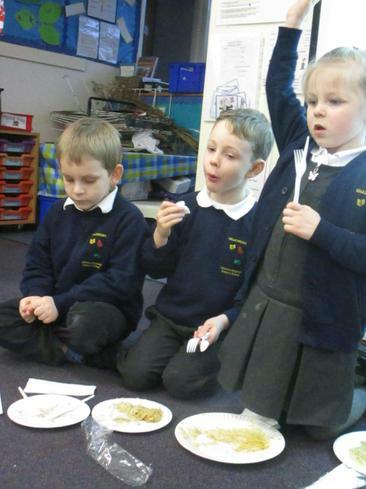 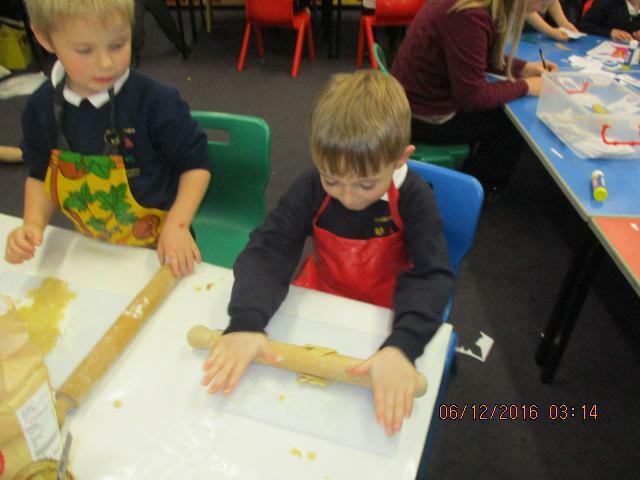 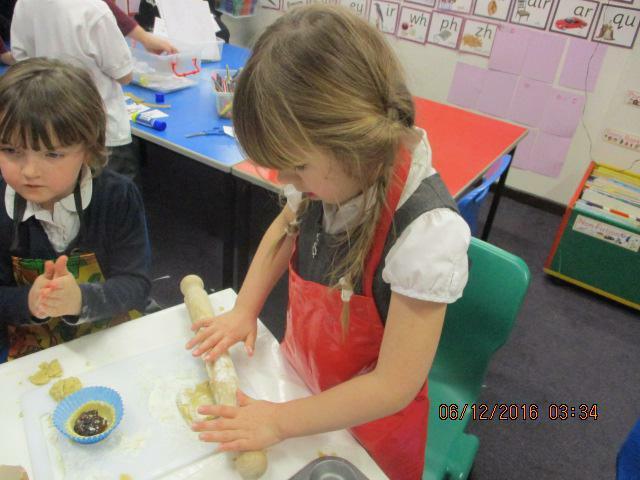 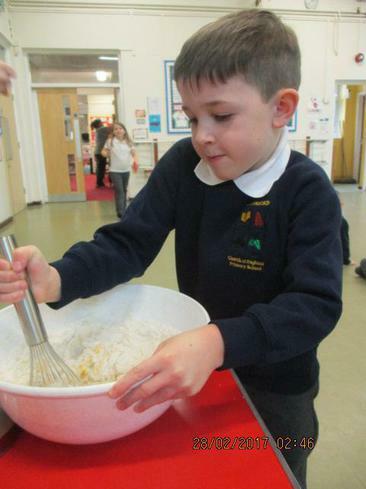 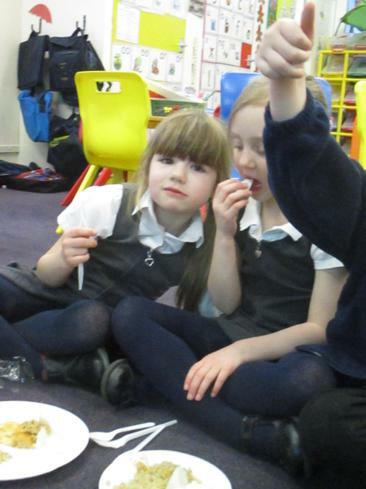 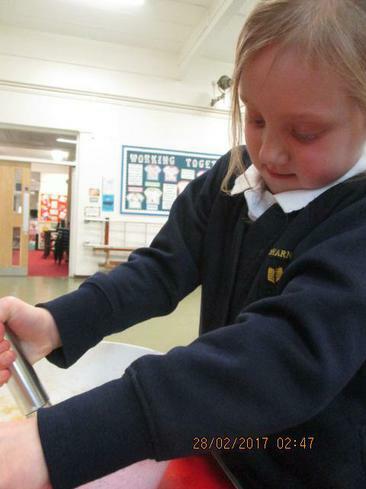 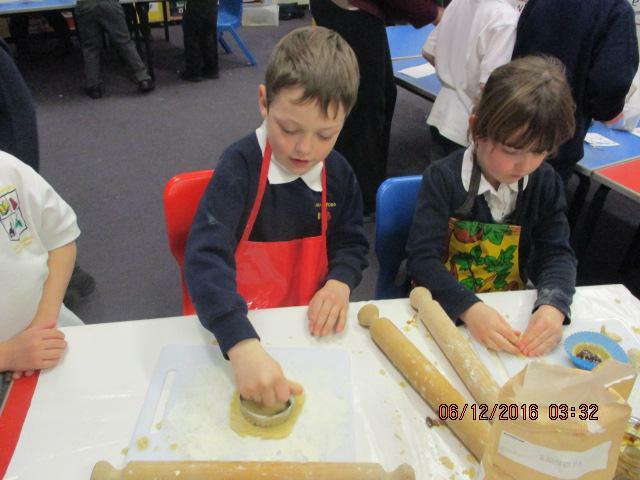 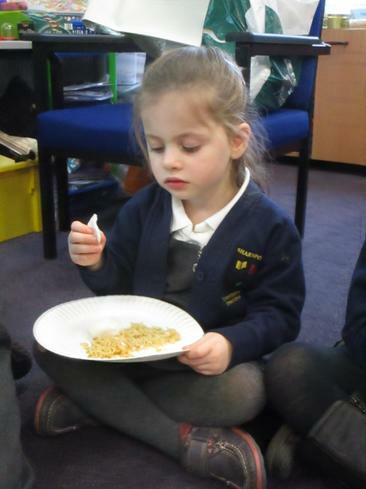 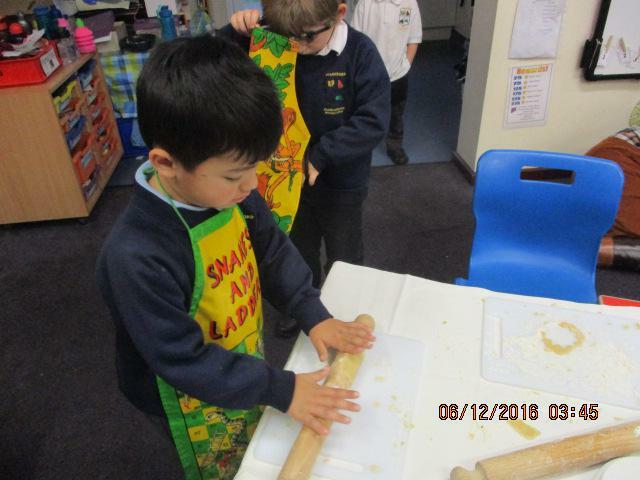 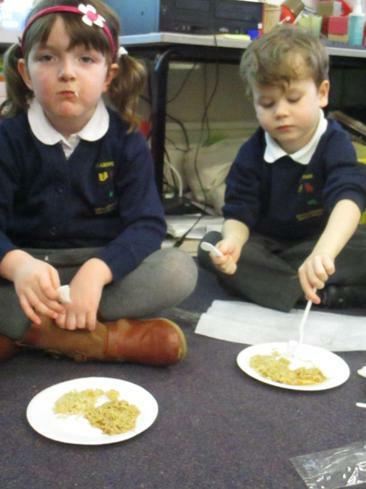 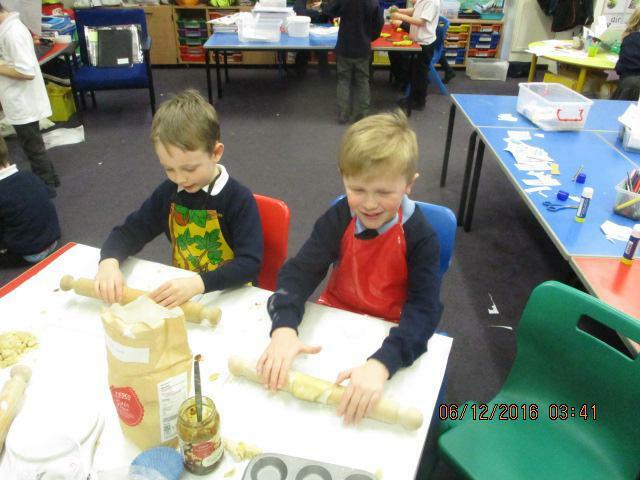 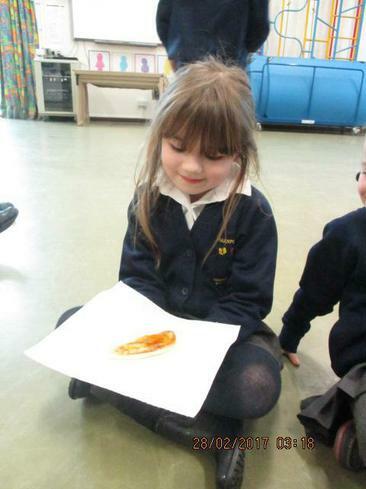 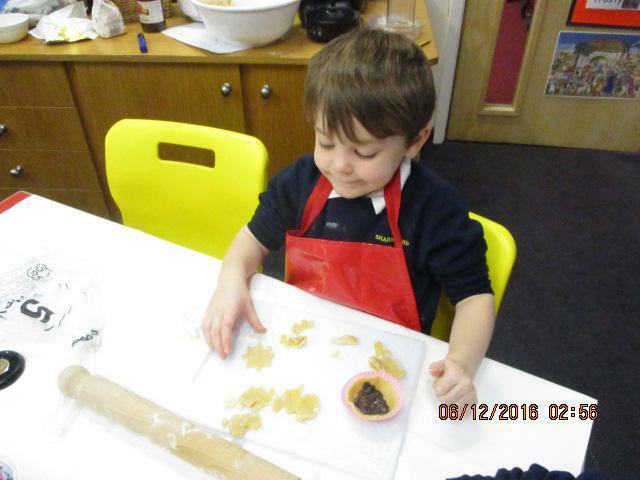 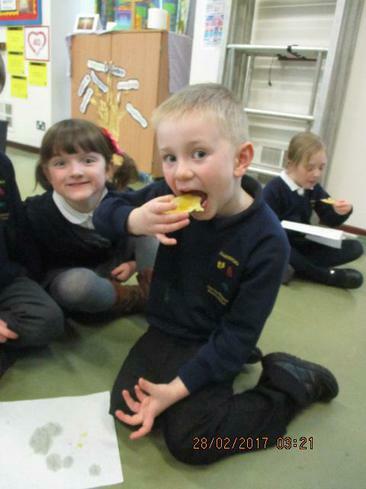 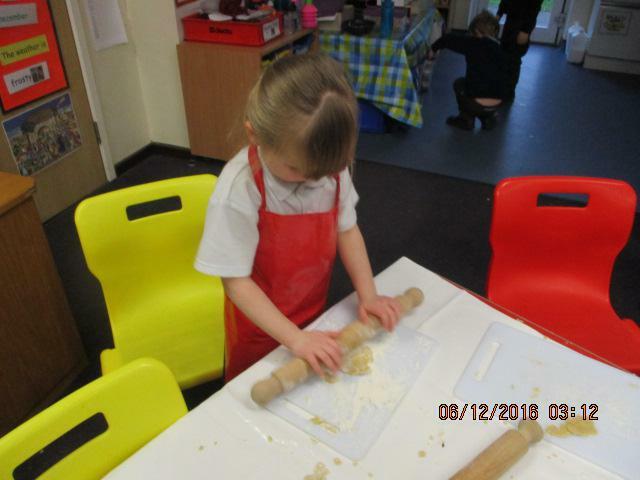 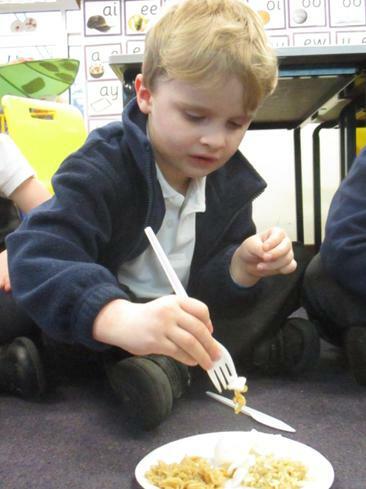 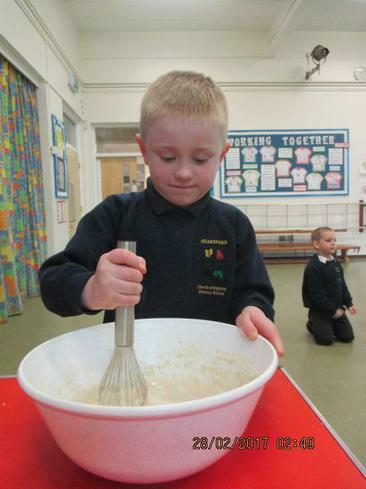 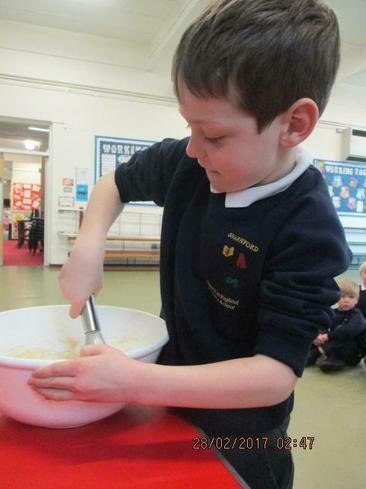 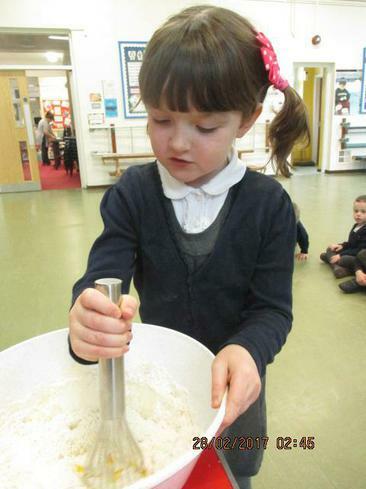 The children enjoyed handling food products such as rice, noodles and prawn crackers in their imaginary play. 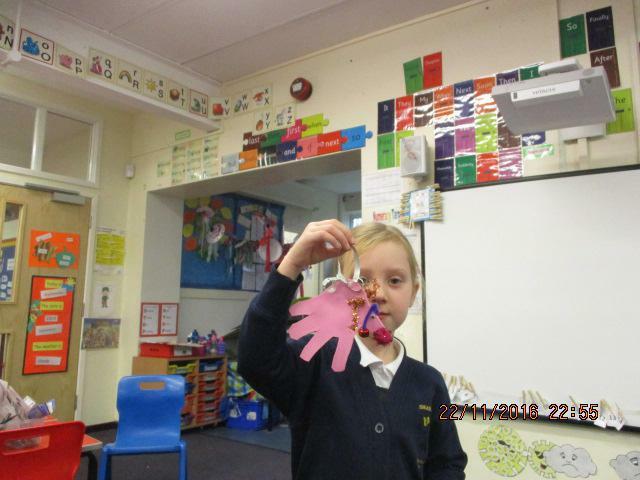 We listened to the Chinese New Year story about the animals and used stick puppets to act out the story and watched a video clip all about how Chinese families celebrate this yearly celebration. 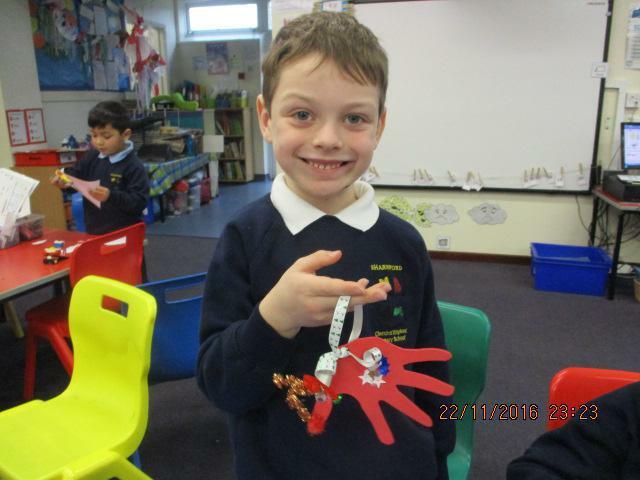 A range of Chinese artefacts were kindly brought in by Mrs Horton and shared with the children. 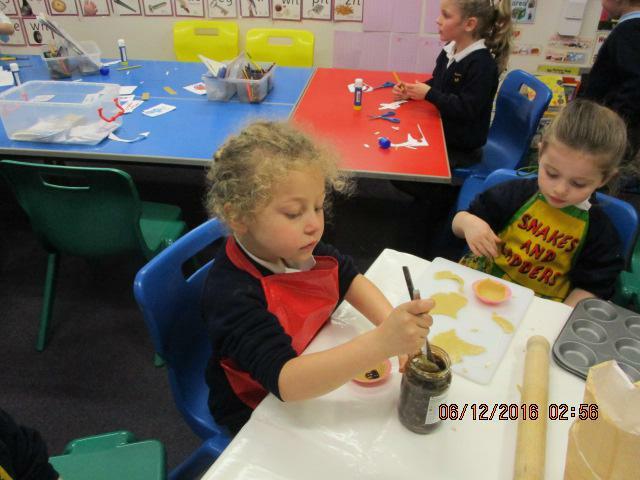 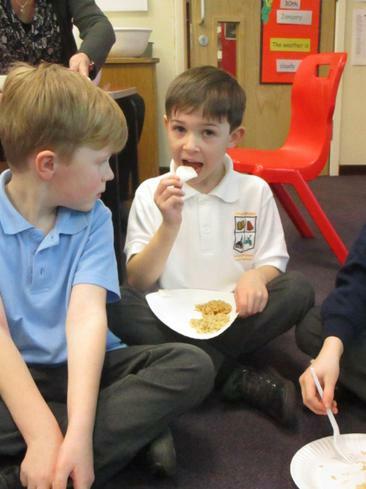 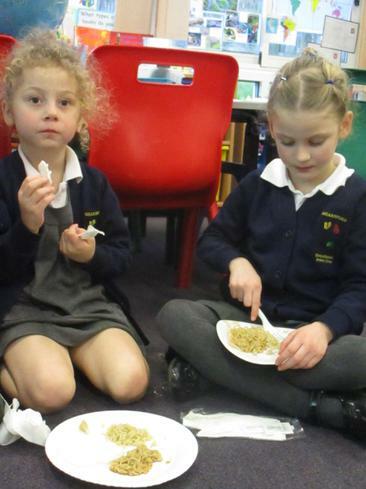 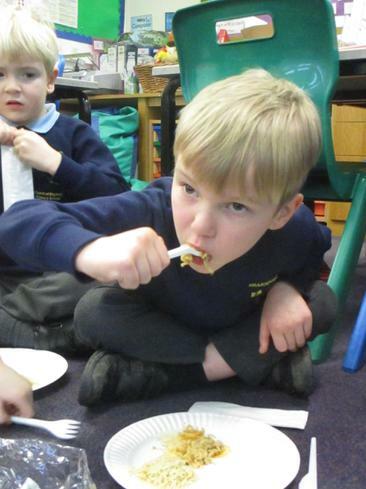 We enjoyed making a range of Chinese crafts such as lanterns, cards, snakes, dragons and money envelopes but the most popular activity seemed to be the sampling of delicious Chinese food! 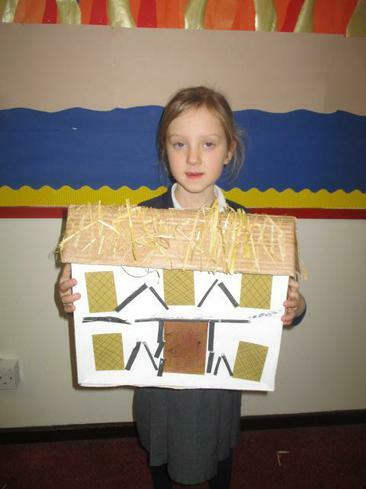 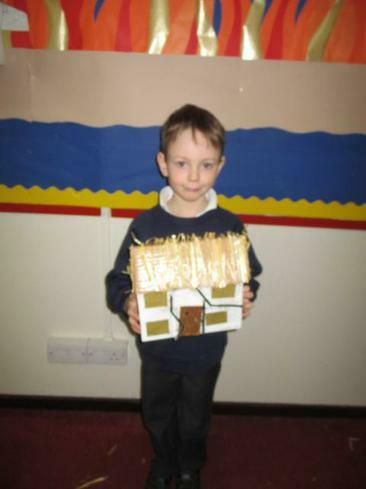 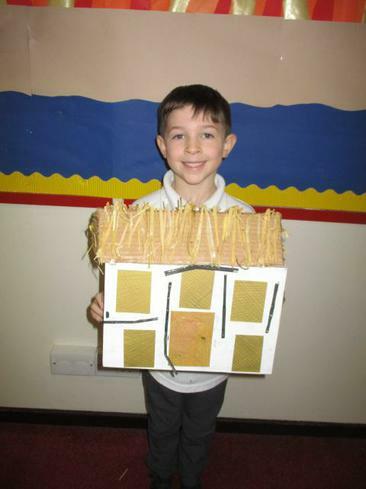 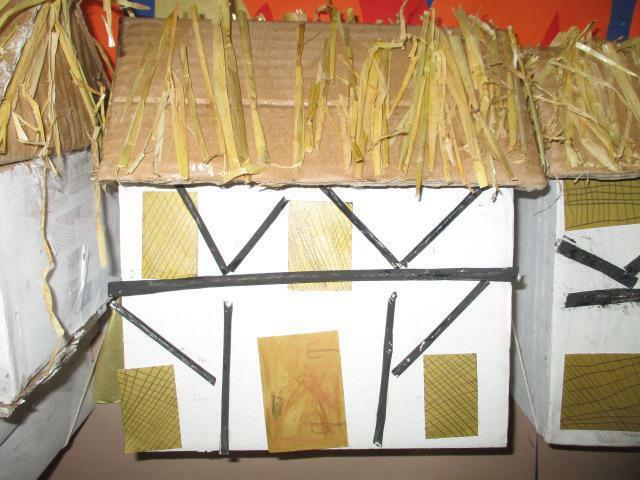 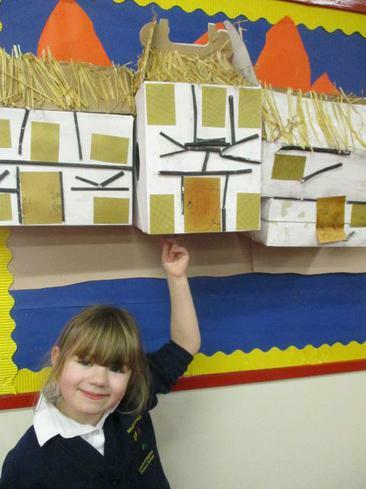 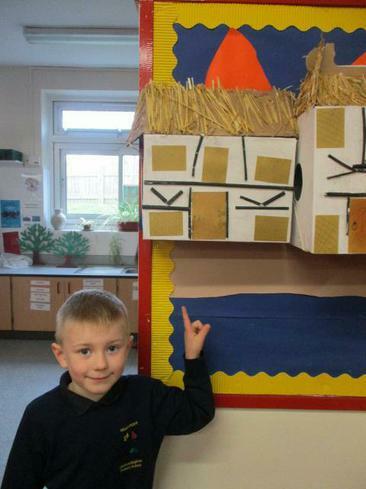 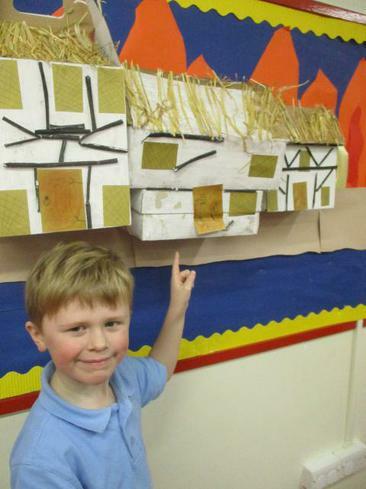 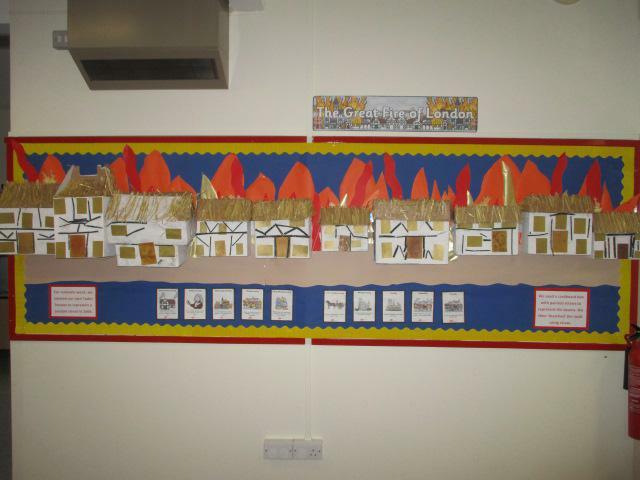 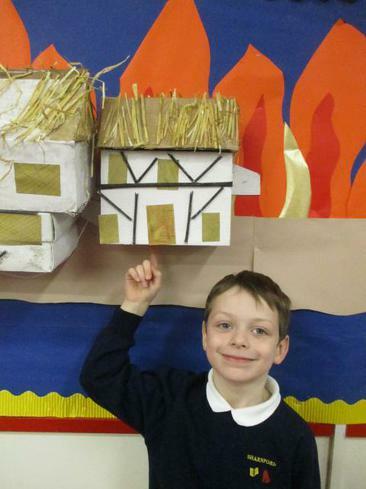 For innovate week we created our own tudor houses to represent a London street in 1666. 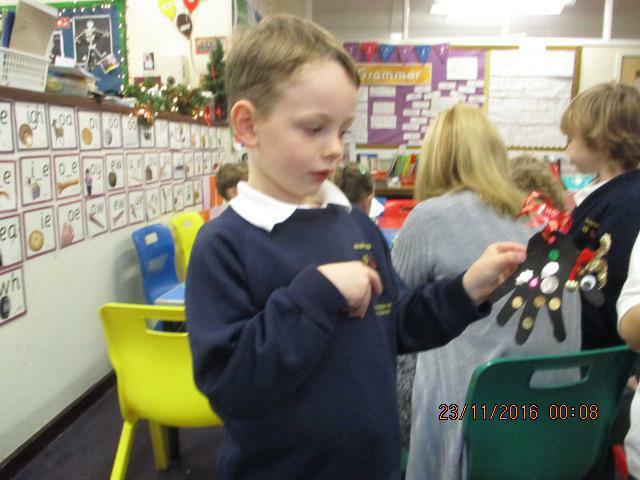 During RE we discovered the Christian meaning behind mince pies and made our own Nativity mince pies. 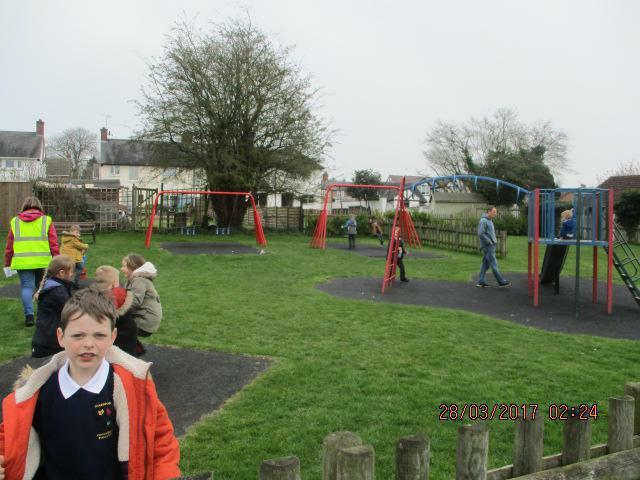 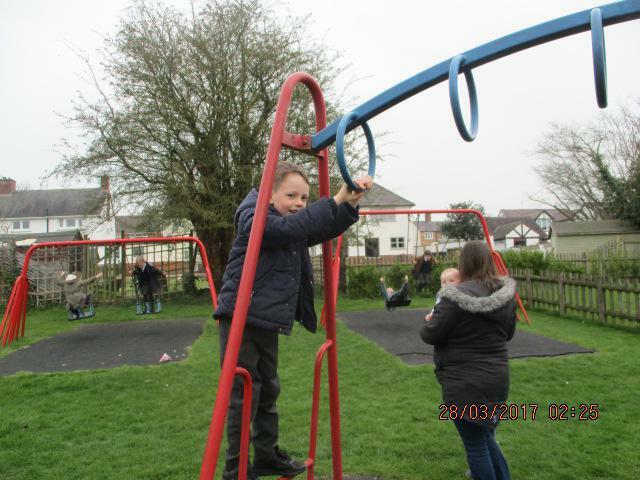 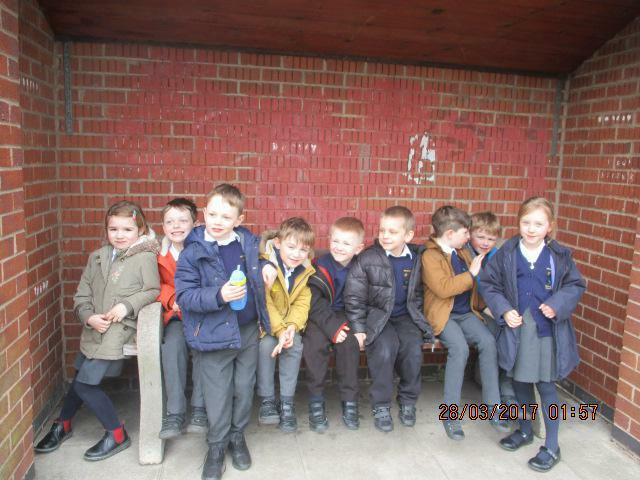 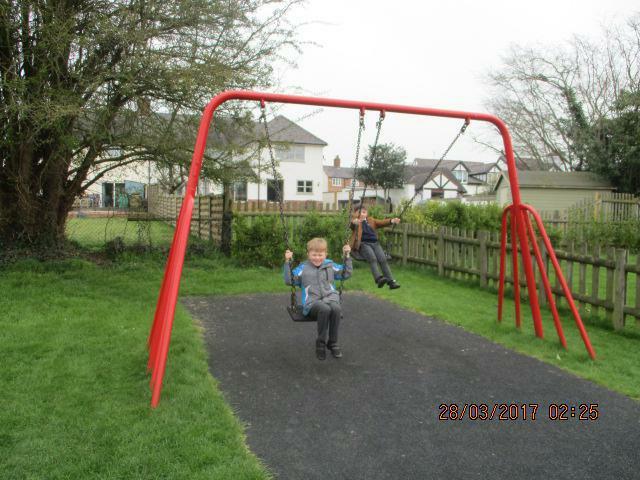 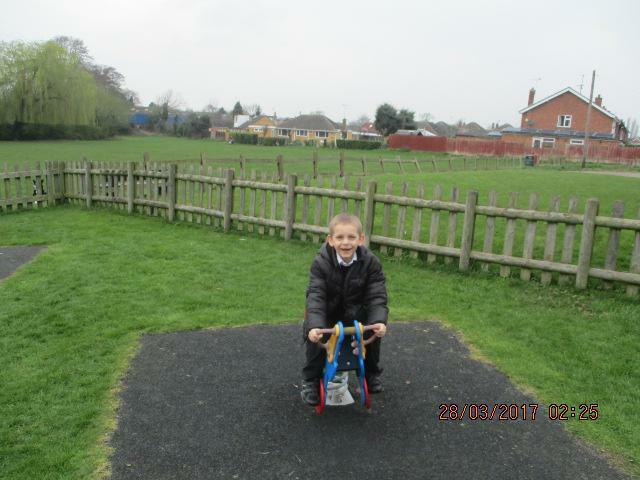 Willow children enjoyed DT day. 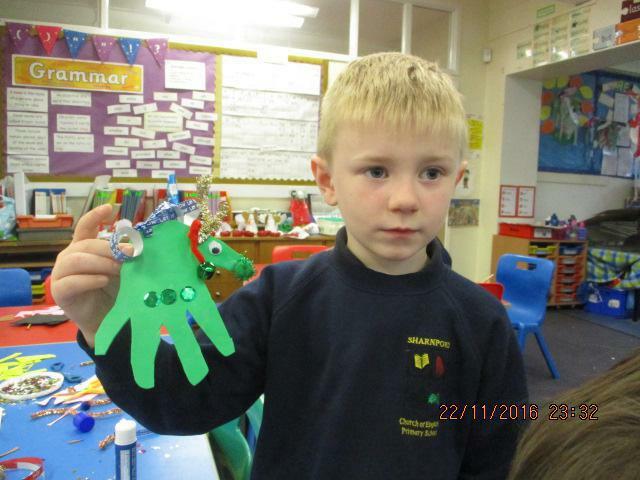 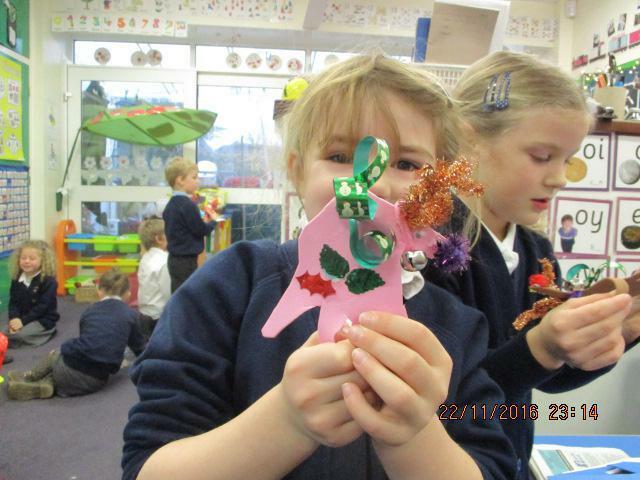 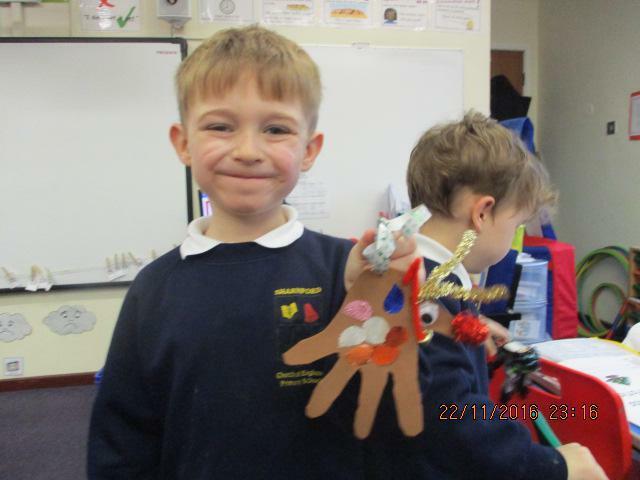 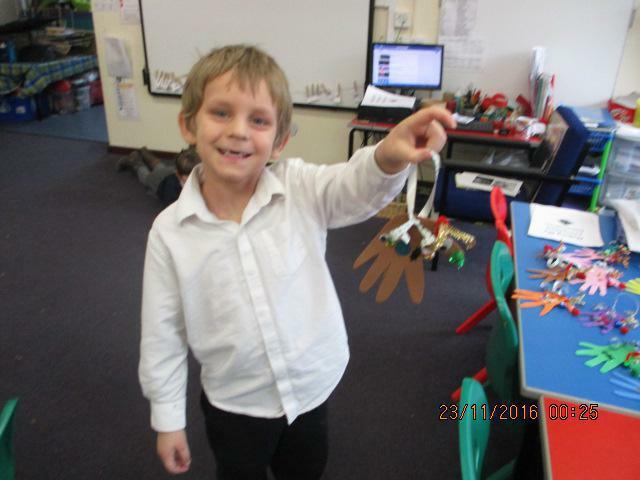 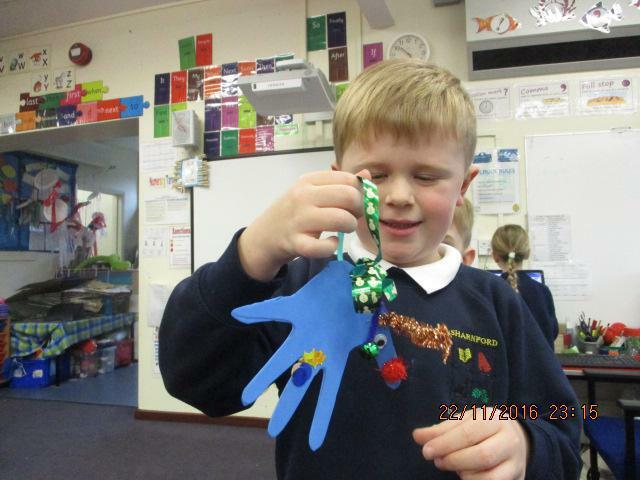 We designed and made a reindeer Christmas tree decoration. 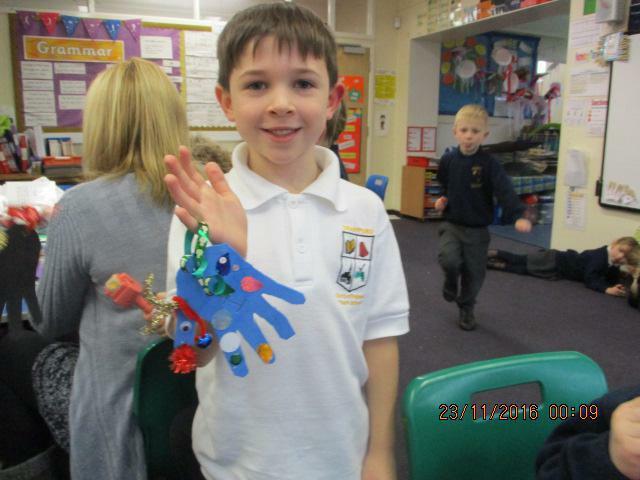 We then invited our parents and carers to come and have a look at our amazing, festive creations!